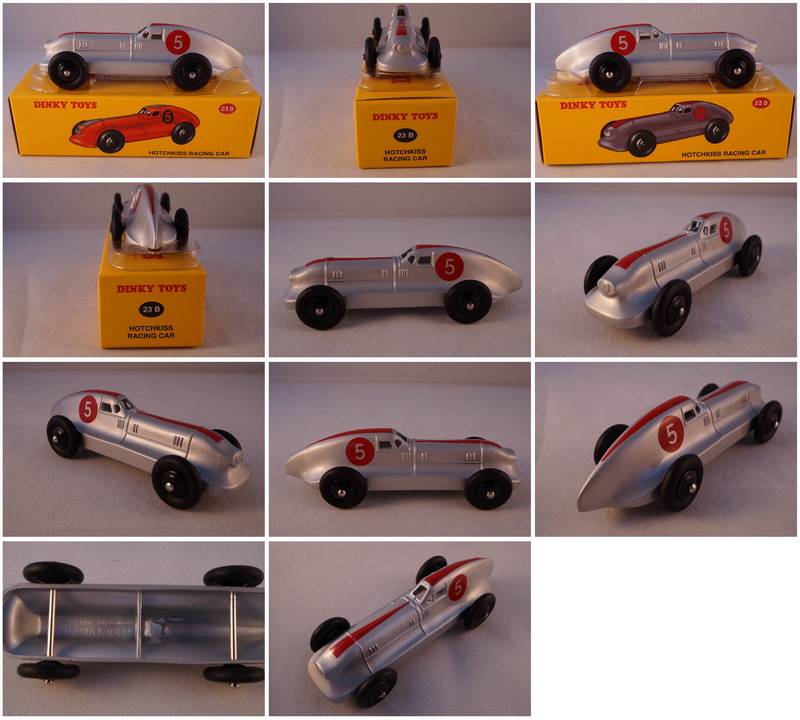 Dinky Toys by Atlas Editions #23B Hotchkiss racing car #5 (Silver). 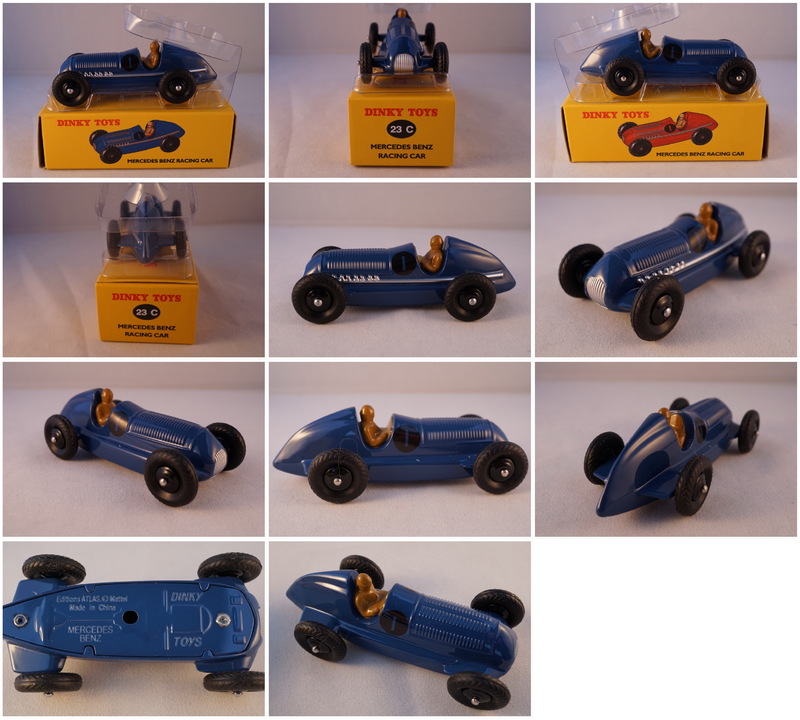 Dinky Toys by Atlas Editions #23C Mercedes Benz racing car #1 (Blue). 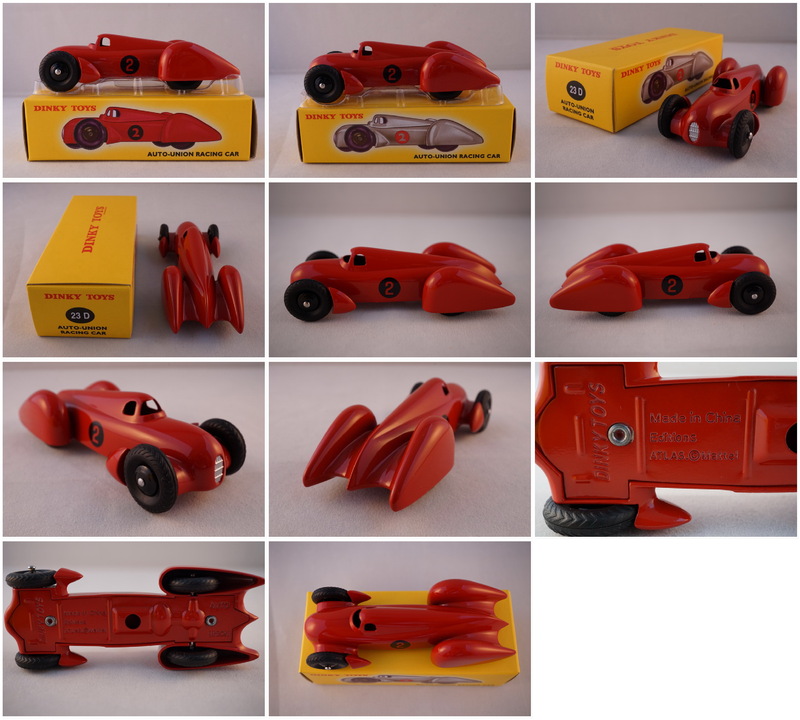 Dinky Toys by Atlas Editions #23D Auto-Union racing car #2 (Red). 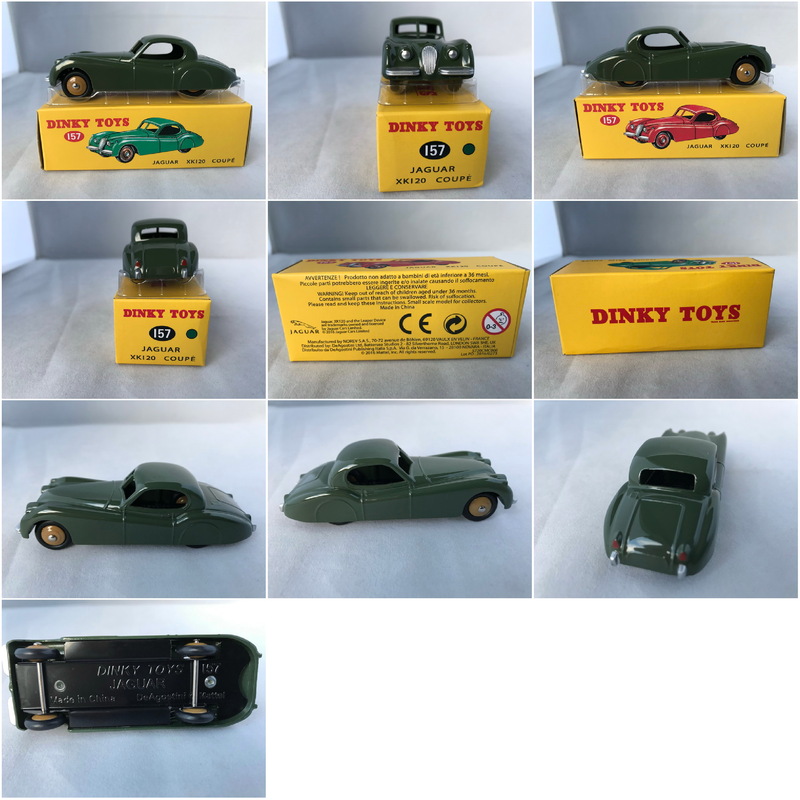 Dinky Toys by Atlas Editions #24B Peugeot 403 Berline (Green). 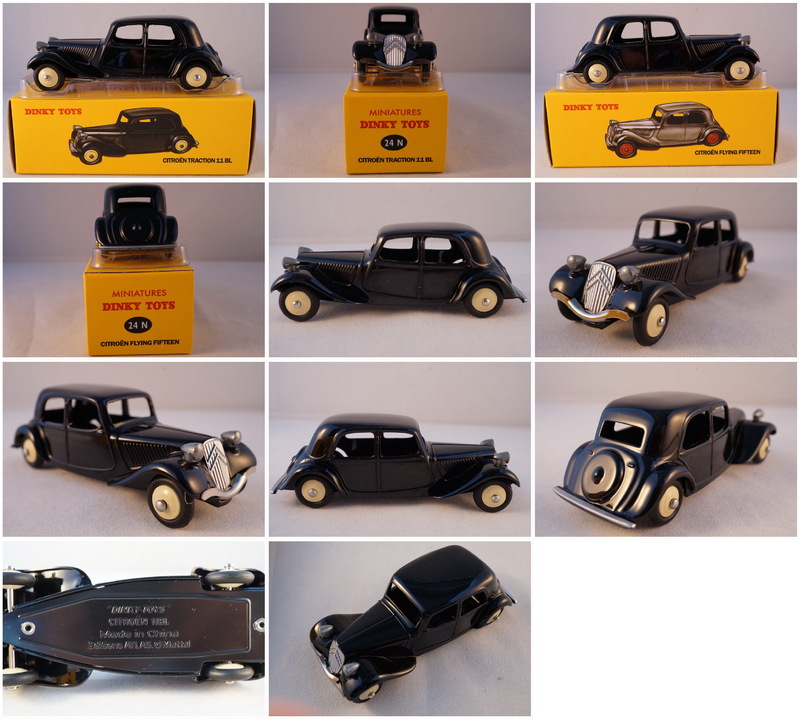 Dinky Toys by Atlas Editions #24B Peugeot 403 Berline (Black). 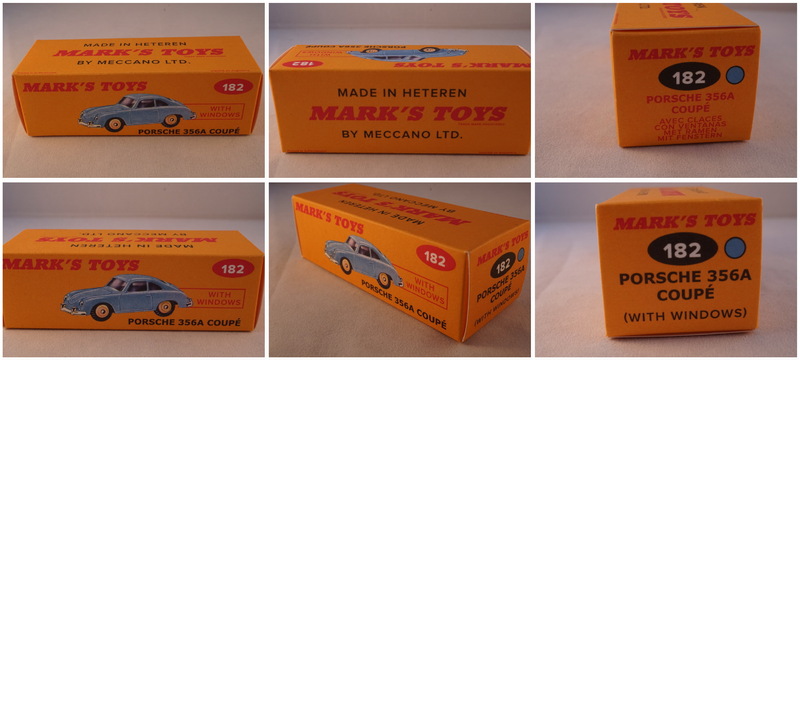 Diecast 1:43 scale (c) 2011 Mattel. 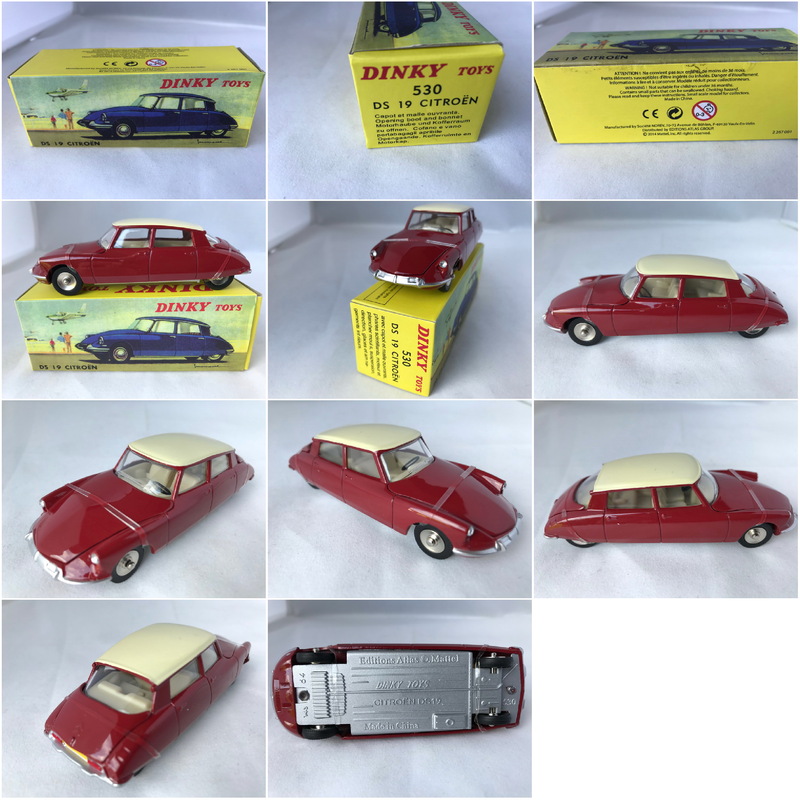 Dinky Toys by Atlas Editions #24C Coach Panhard (Grey). 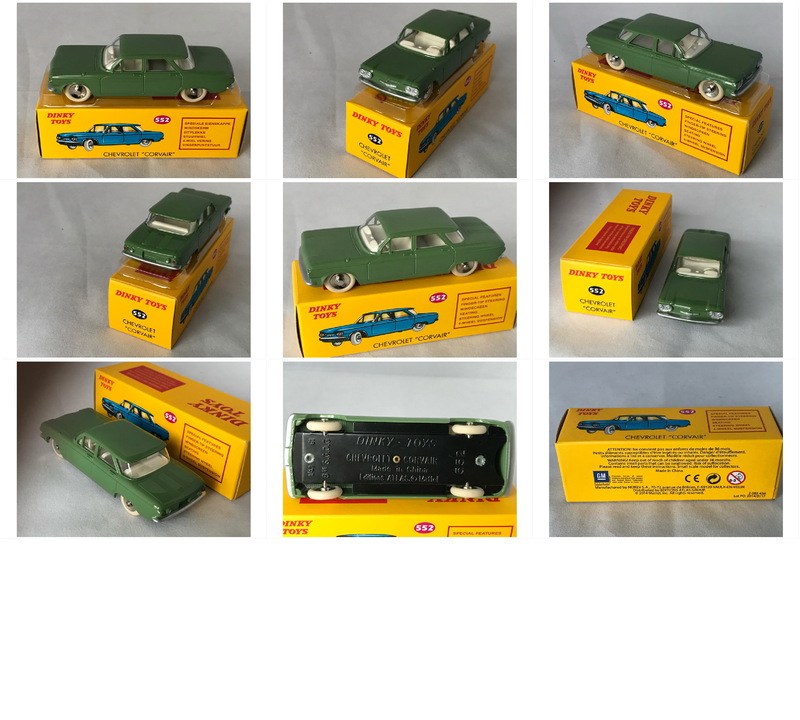 Dinky Toys by Atlas Editions #24CP Citroen DS19 (Green/White roof). 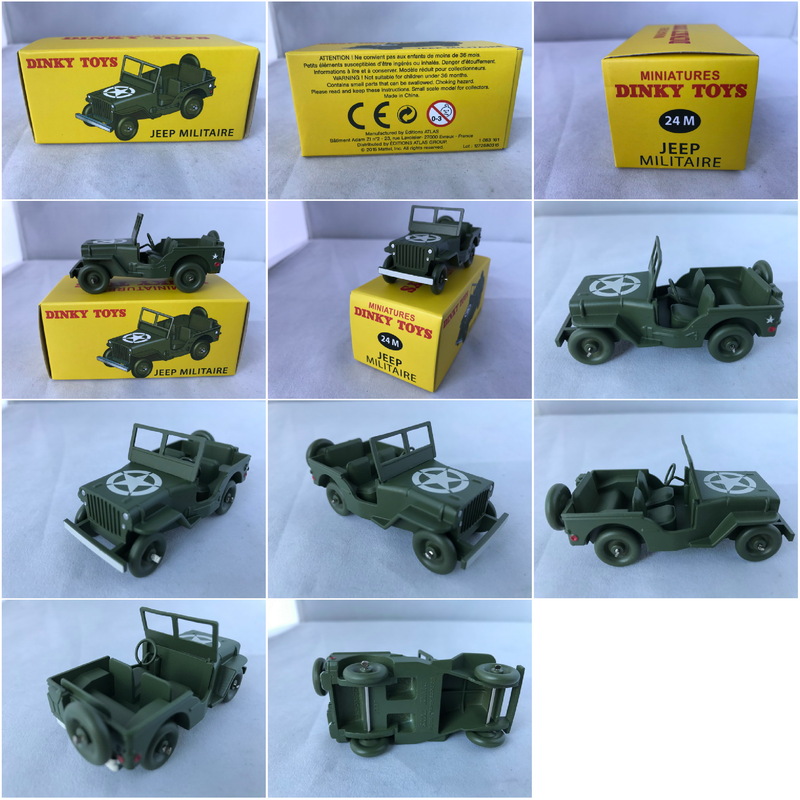 Dinky Toys by Atlas Editions #24M Jeep Militaire (Green). 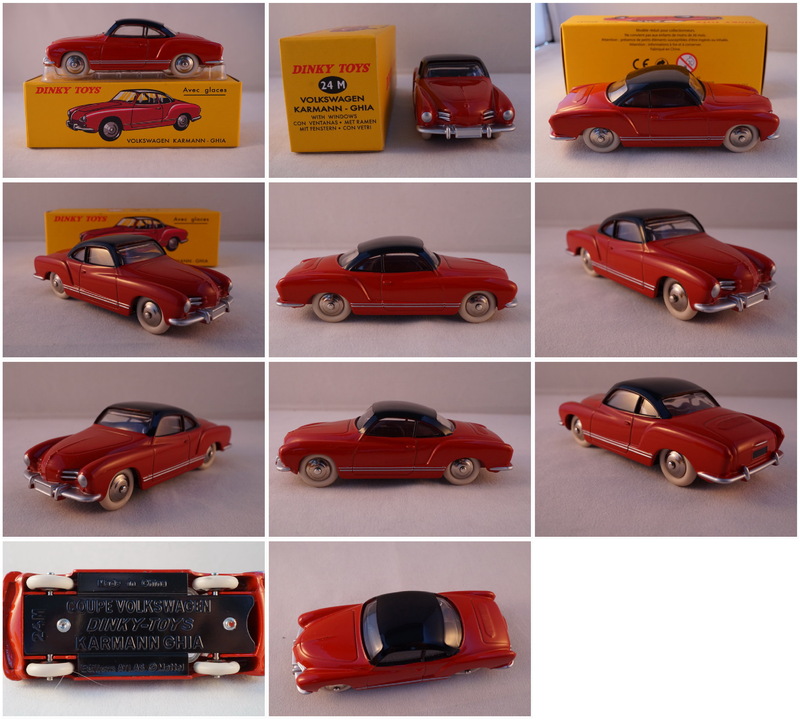 Dinky Toys by Atlas Editions #24M Volkswagen Karmann Ghia (Red, Black roof). 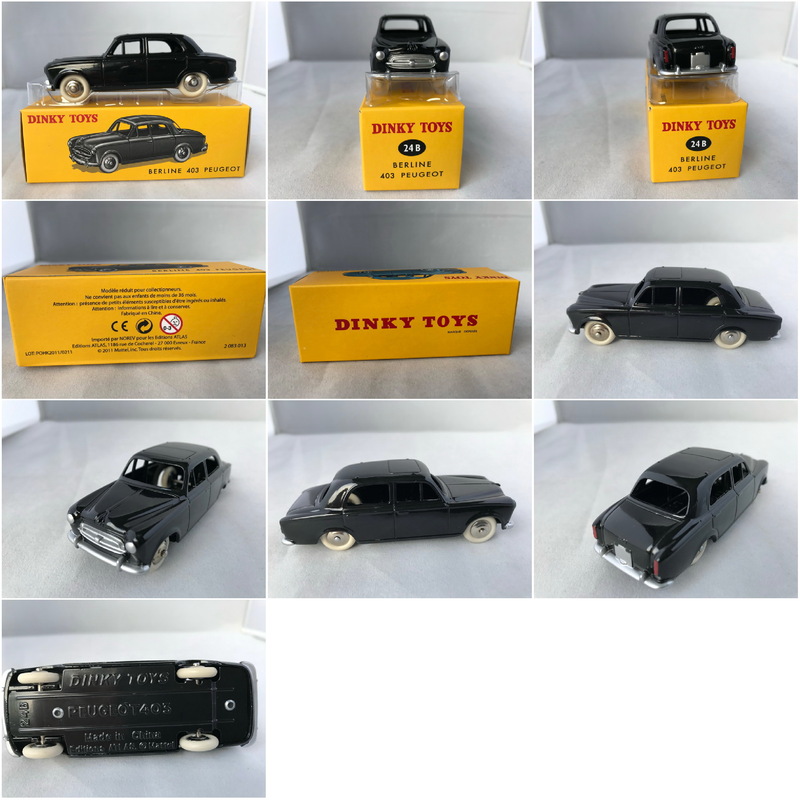 Dinky Toys by Atlas Editions #24N Citroen Traction 11L (Black???????). 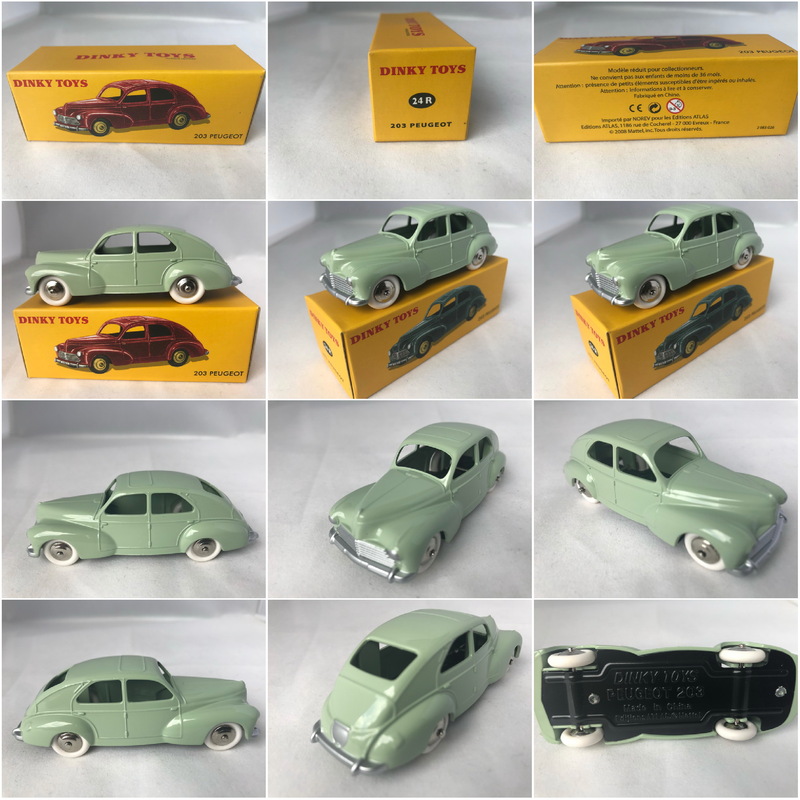 Dinky Toys by Atlas Editions #24R Peugeot 203 (pale Green). 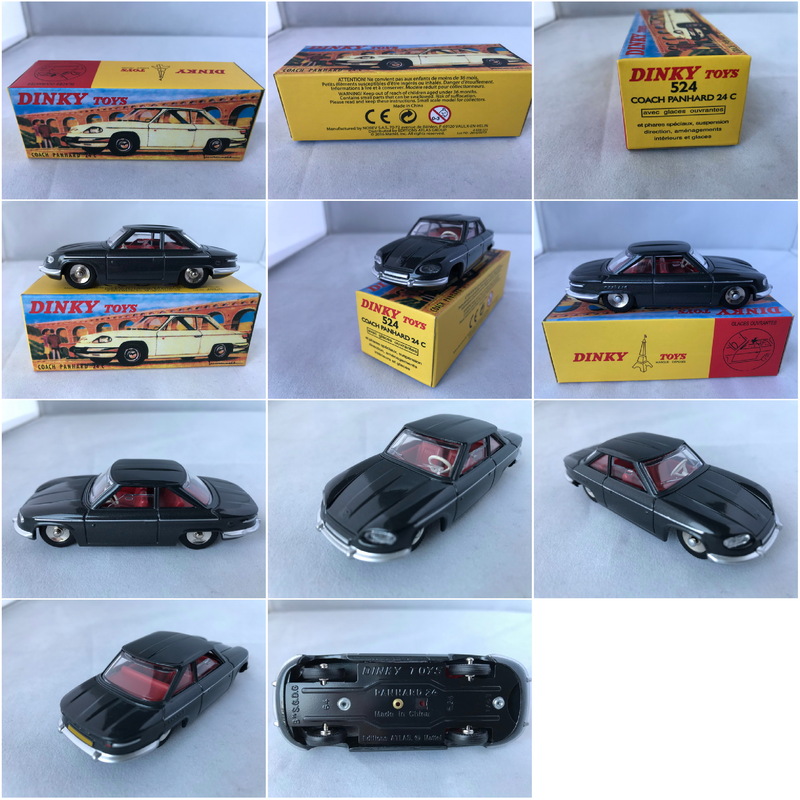 Dinky Toys by Atlas Editions #24S Simca 8 sport (Black). 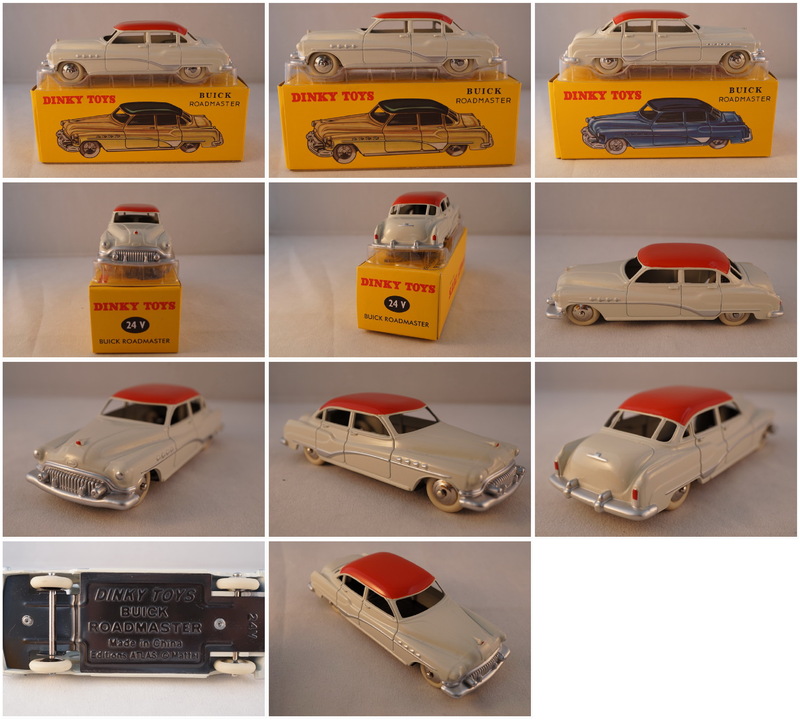 Dinky Toys by Atlas Editions #24V Buick Roadmaster (Cream, Red roof)). 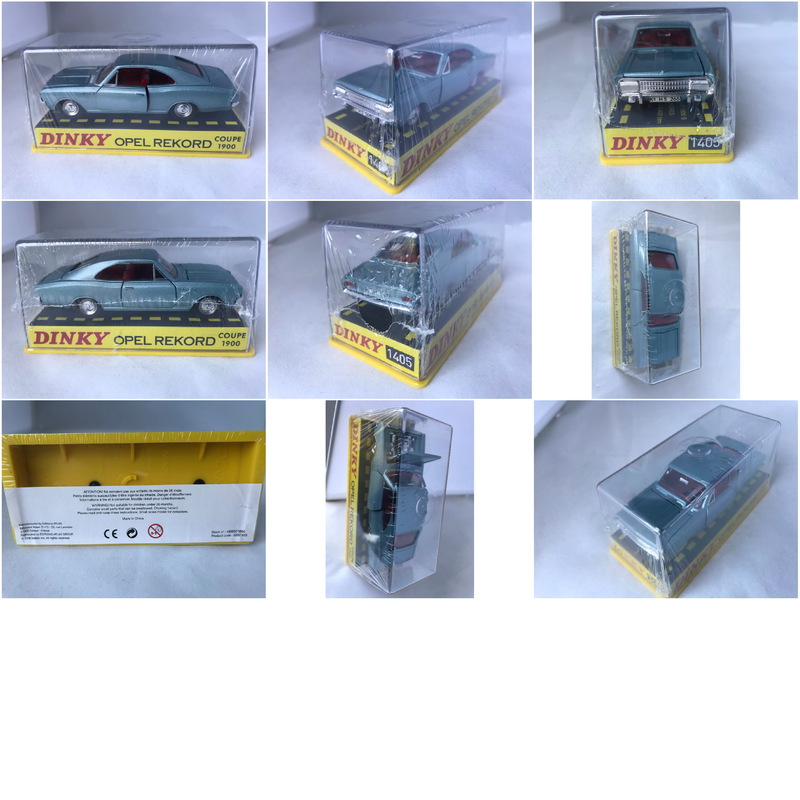 Dinky Toys by DeAgostini #24X Ford Vedette 54 (Blue). 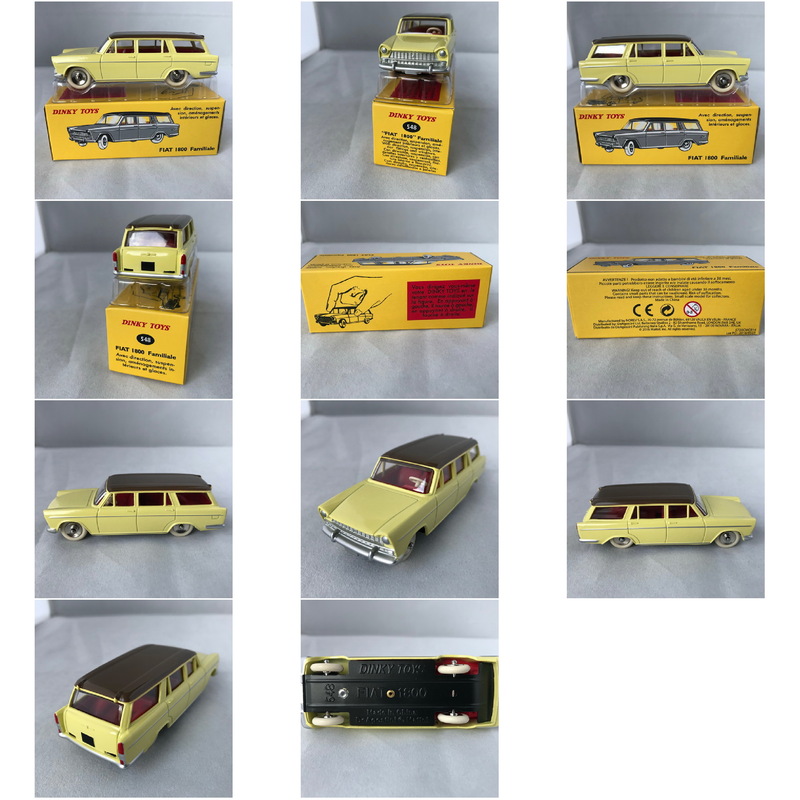 Dinky Toys by Atlas Editions #24Z Simca Versailles (Yellow). 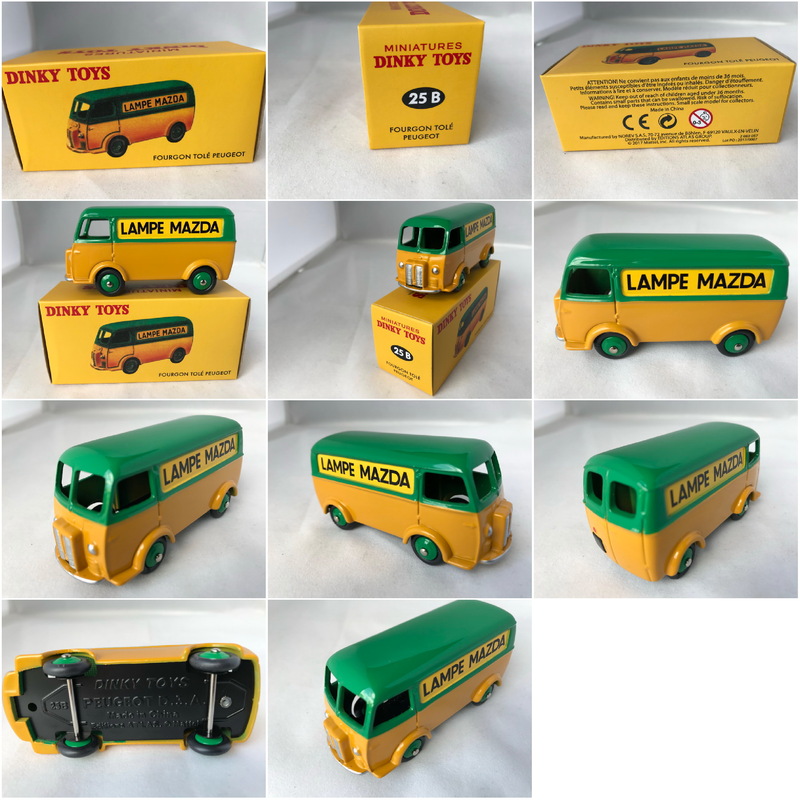 Dinky Toys by Atlas Editions #25B Fourgon Tolé Peugeot "LAMPE MAZDA"(Green/Yellow). 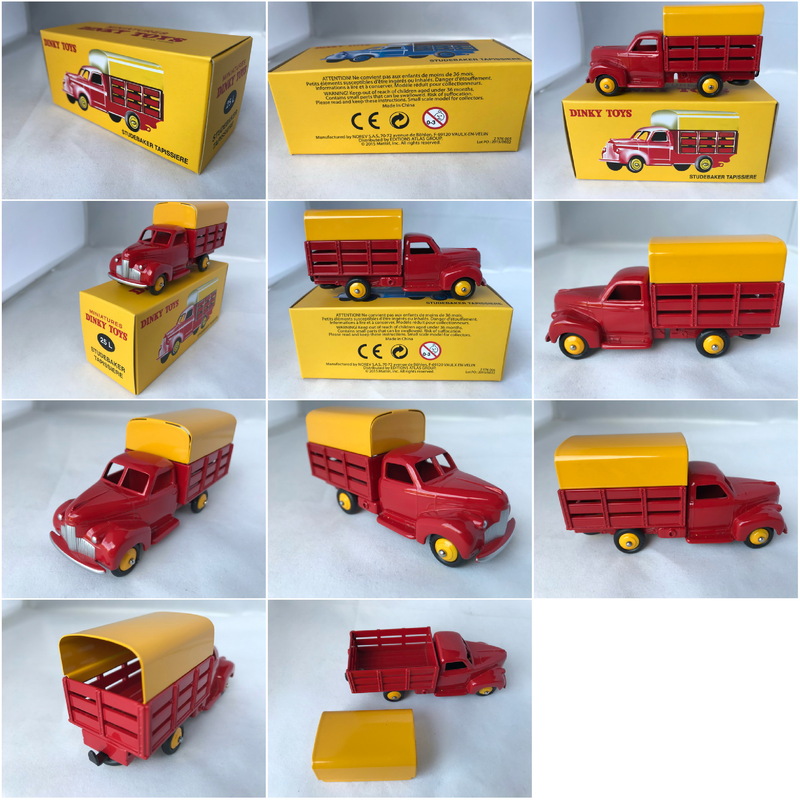 Dinky Toys by Atlas Editions #25BR Peugeot Fourgon Tolé ËSSO"prototype (Red). 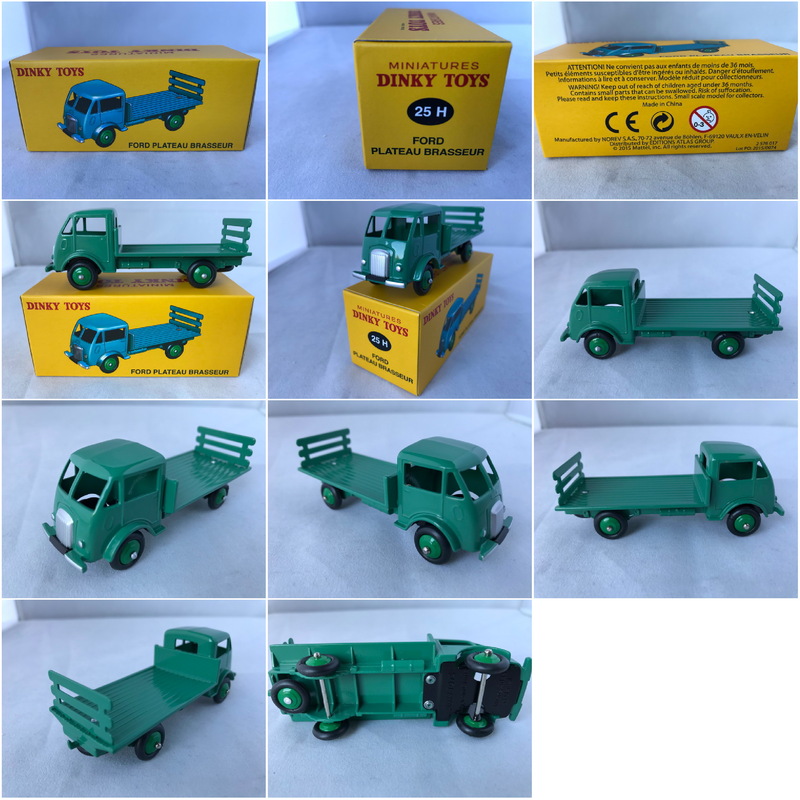 Dinky Toys by Atlas Editions #25H Ford Plateau Brasseur (Green). 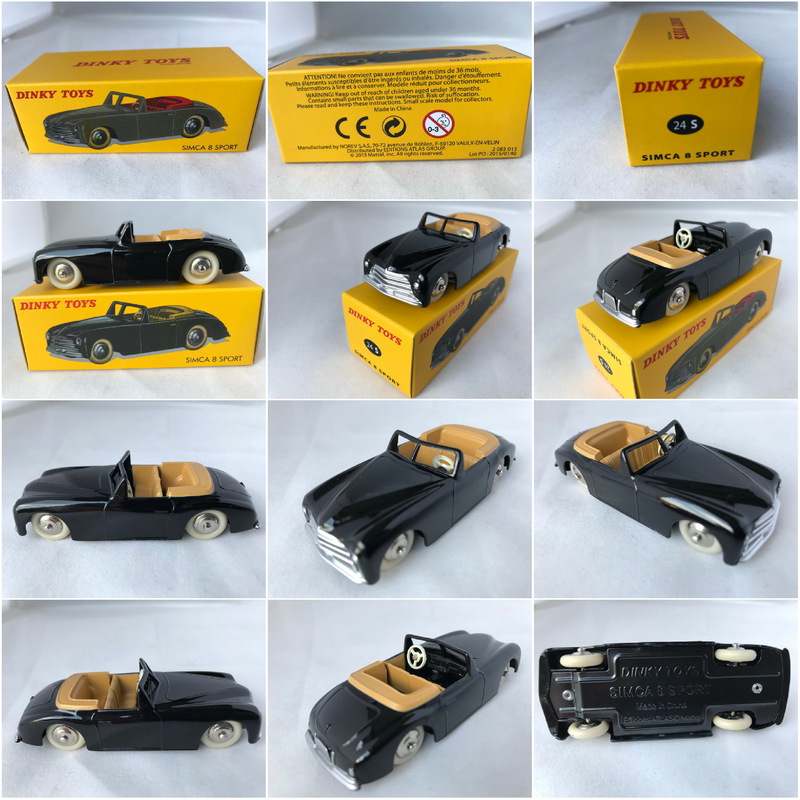 Dinky Toys by Atlas Editions #25JJ Ford Camion Baché "CALBERSON" version 1950 (Yellow/Black). 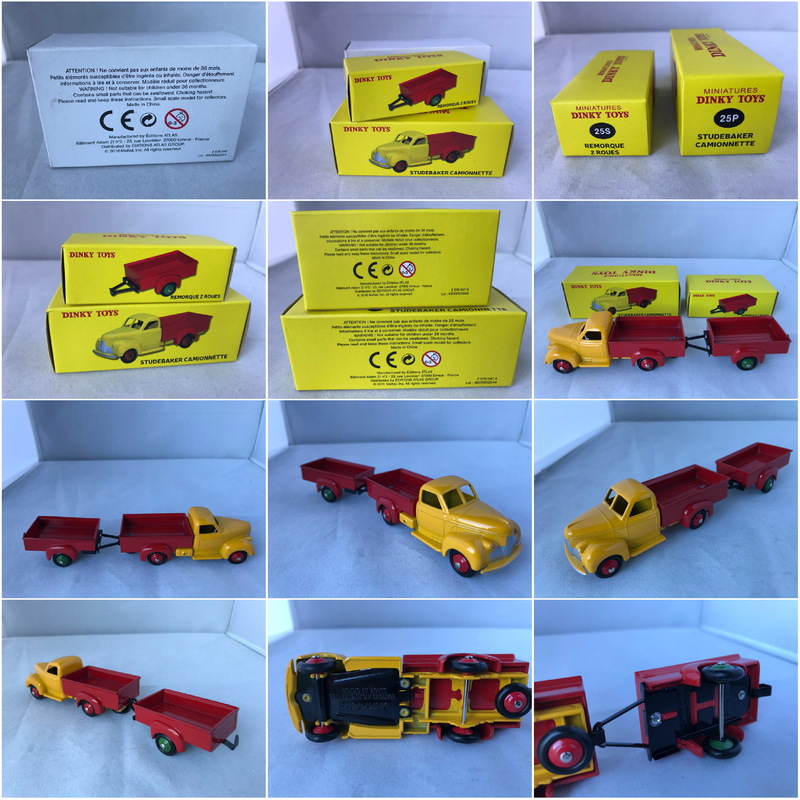 Dinky Toys by Atlas Editions #25L Studebaker Tapissiere (Red/Yellow). 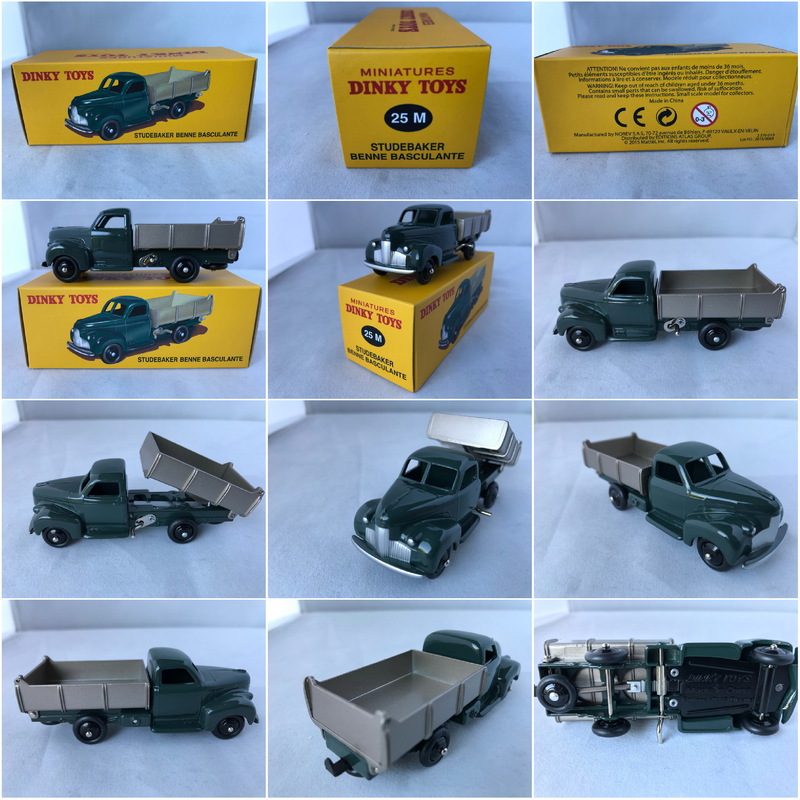 Dinky Toys by Atlas Editions #25M Studebaker Benne Basculante (Green). 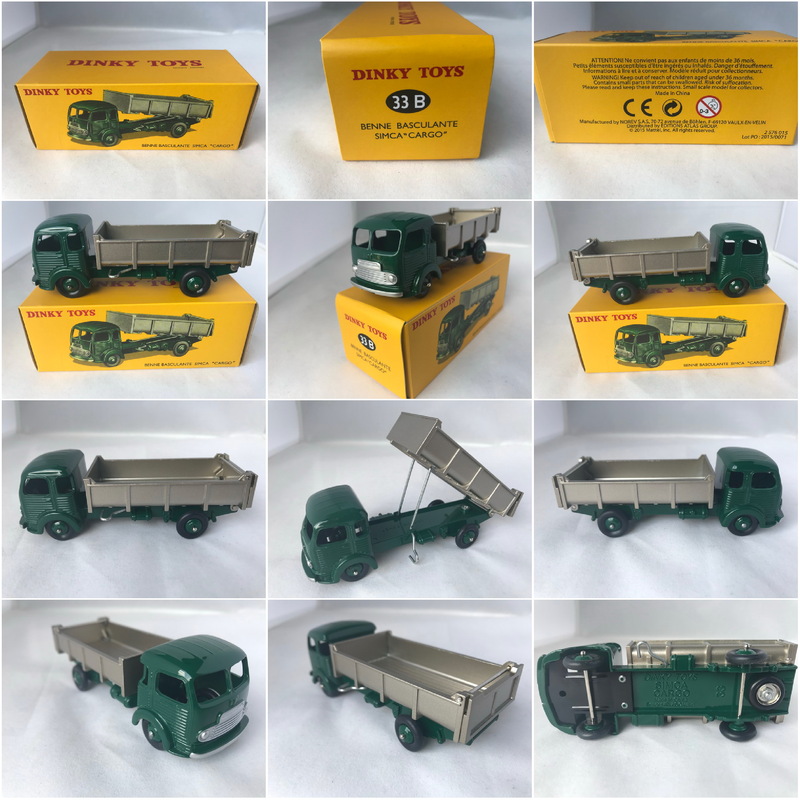 Dinky Toys by Atlas Editions #25M Ford Benne Basculante (Green). 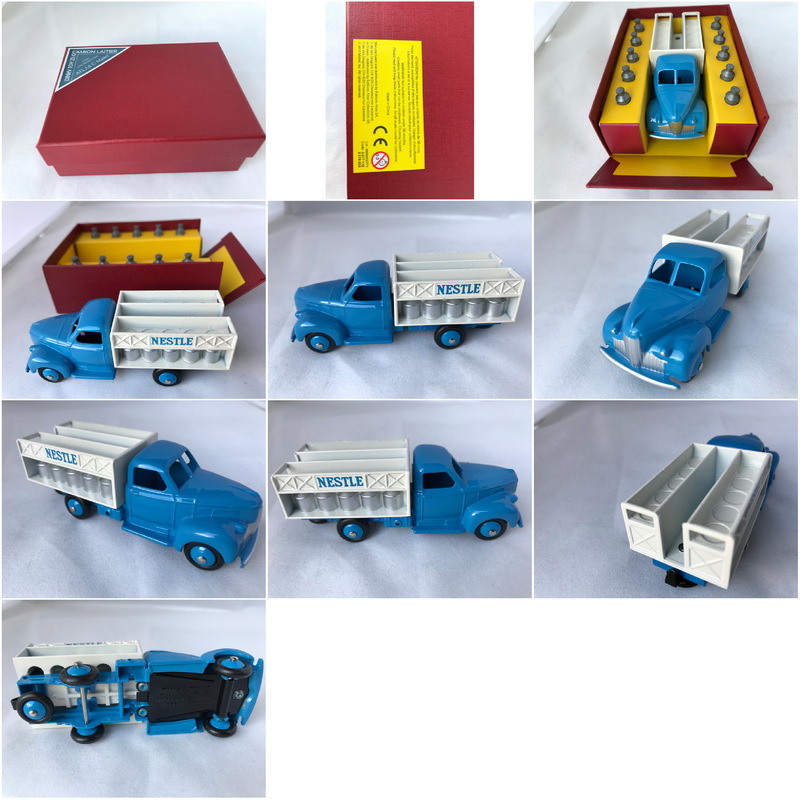 Dinky Toys by Atlas Editions #25O Camion Laitier NESTLE (Blue/White). 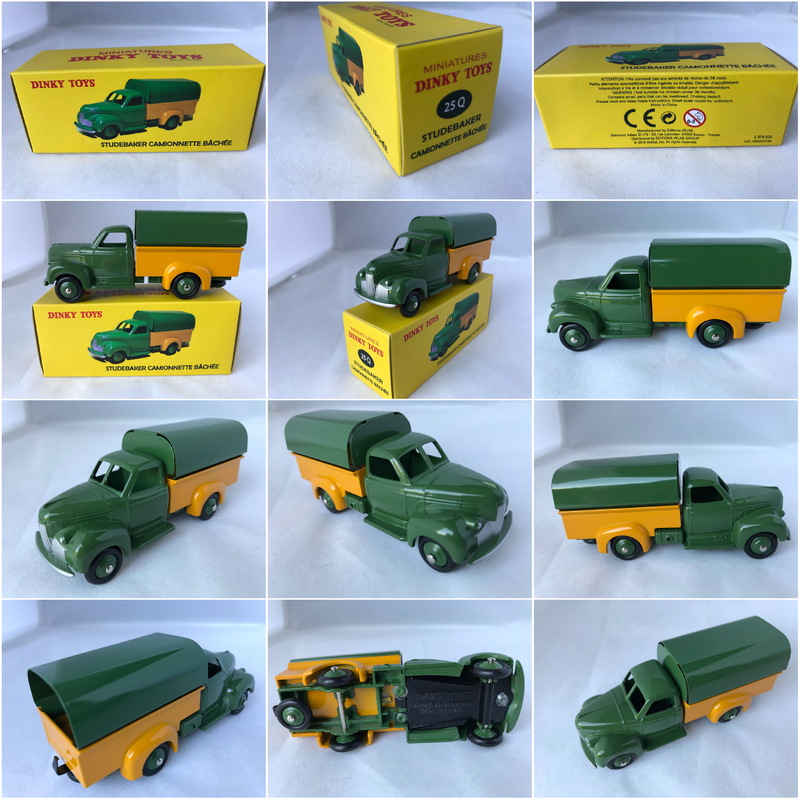 Dinky Toys by Atlas Editions #25Q Studebaker Camionette Bachee (Green/Yellow). 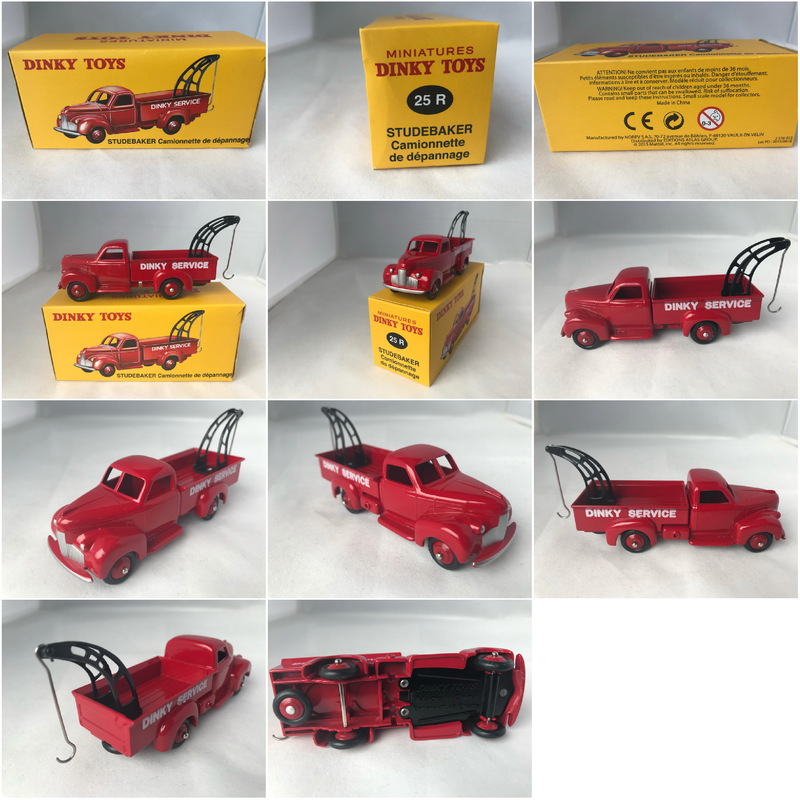 Dinky Toys by Atlas Editions #25R Studebaker Camionette de dépannage (Red). 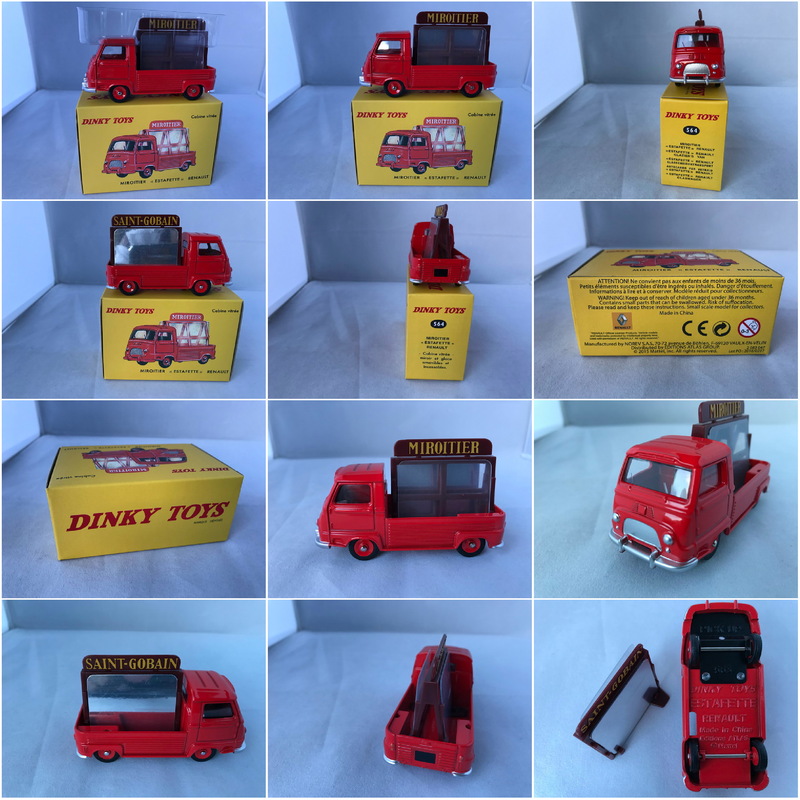 Dinky Toys by Atlas Editions #25R Ford Camionette de dépannager (Red). 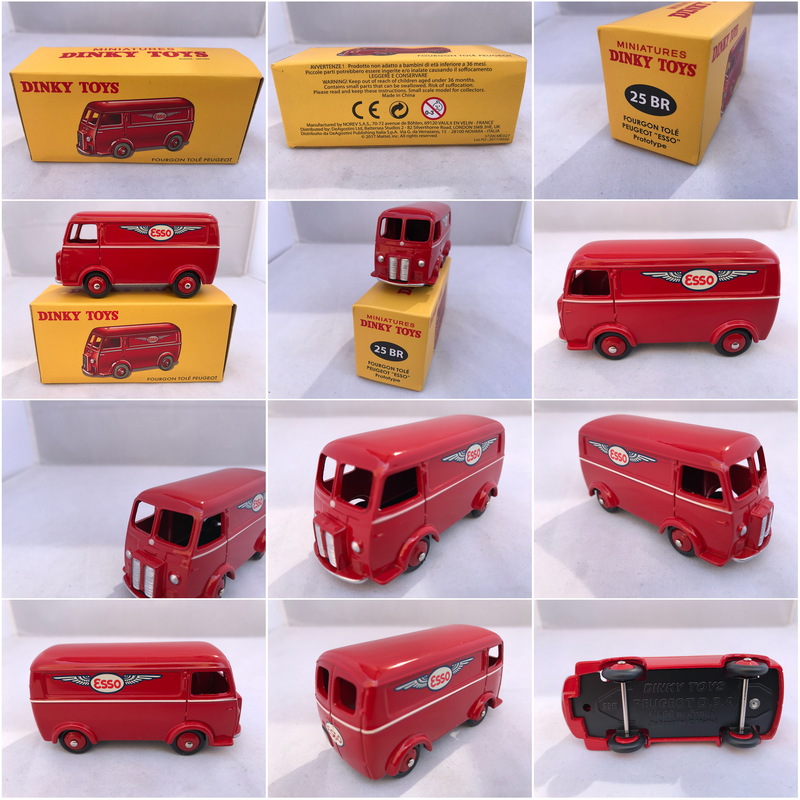 Dinky Toys by Atlas Editions #25U Ford Citerne ESSO (Red). 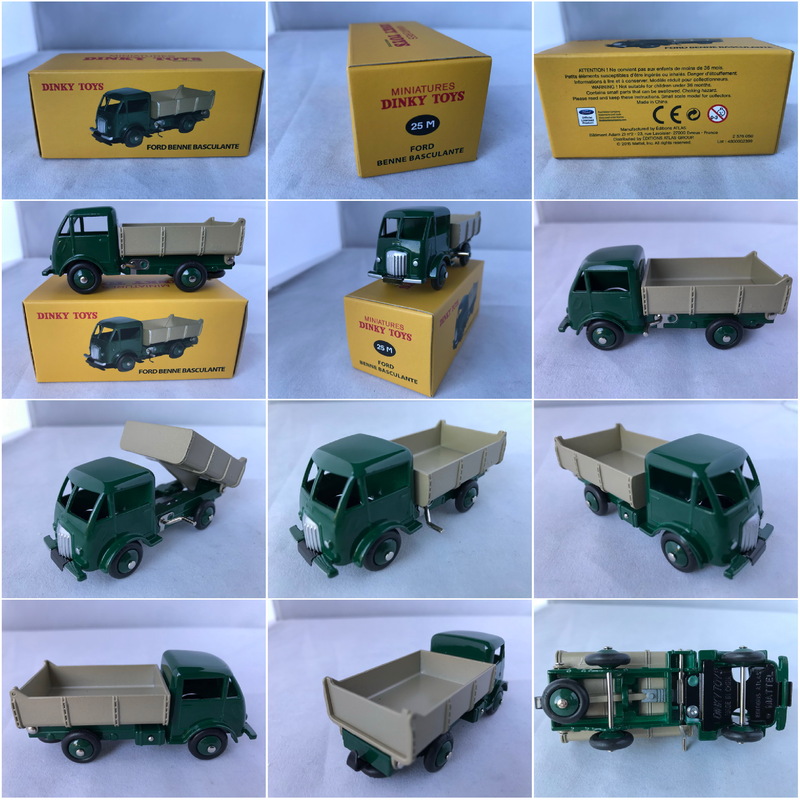 Dinky Toys by Atlas Editions #25V Ford Benne á Ordures (Green). 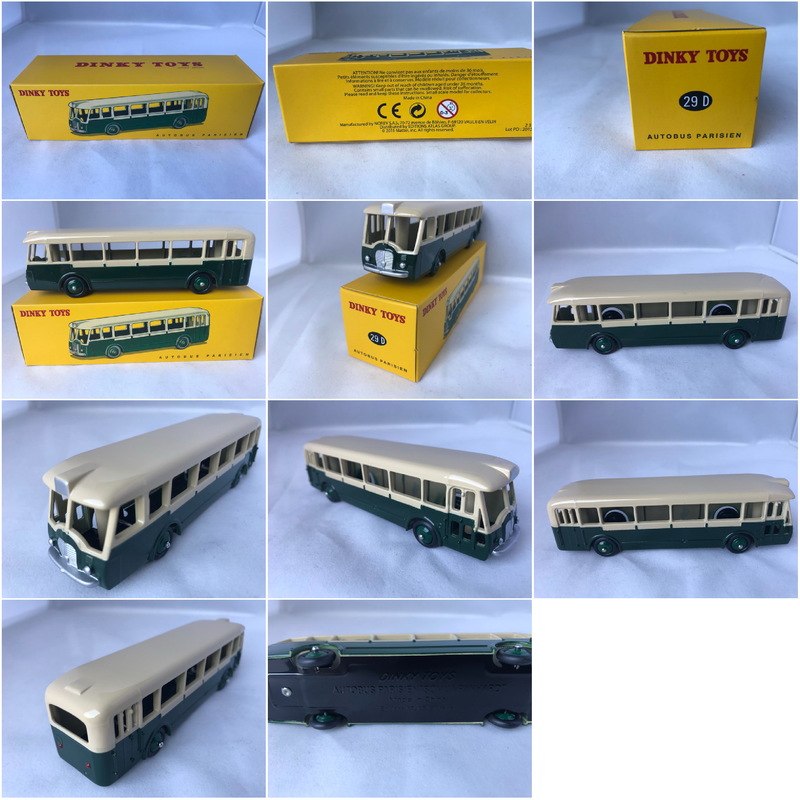 Dinky Toys by Atlas Editions #29D Paris Autobus (Green/Off White). 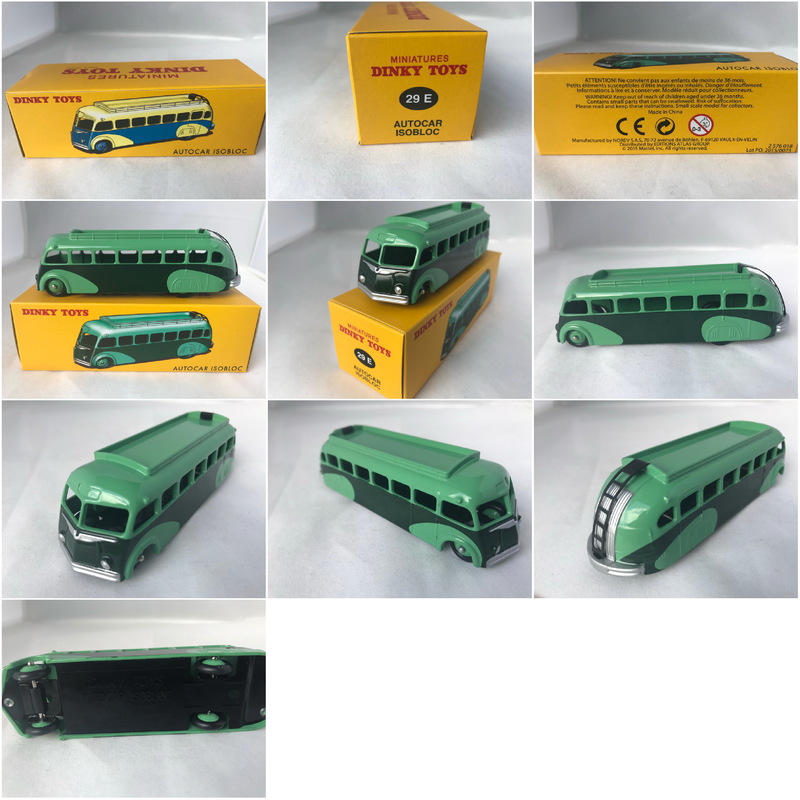 Dinky Toys by Atlas Editions #29E Autocar IsoblocParis Autobus (two tone Green). 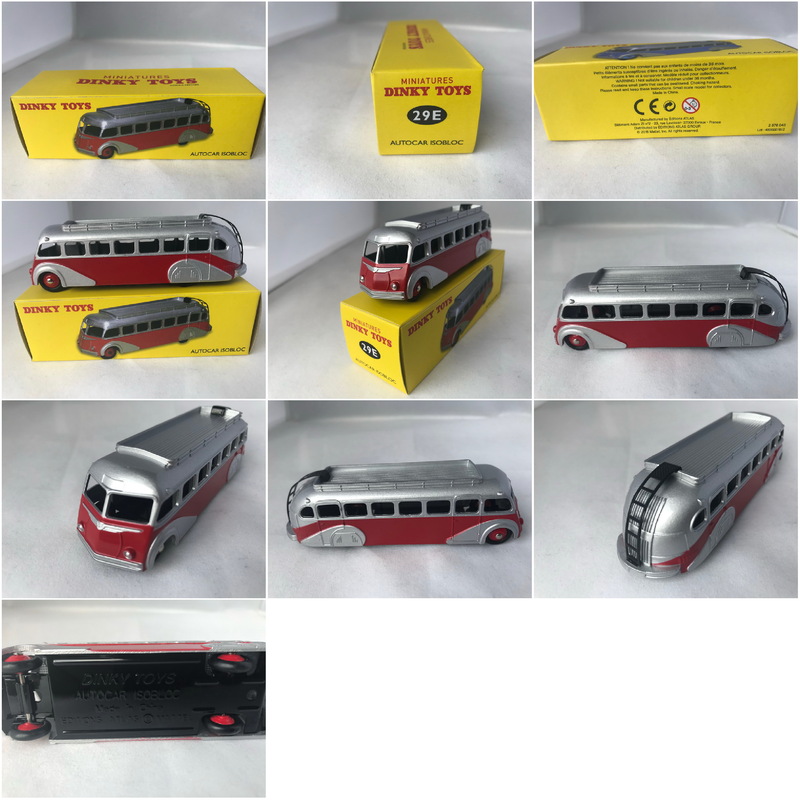 Dinky Toys by Atlas/Norev Editions #29E Autocar IsoblocParis Autobus (Silver/Red). 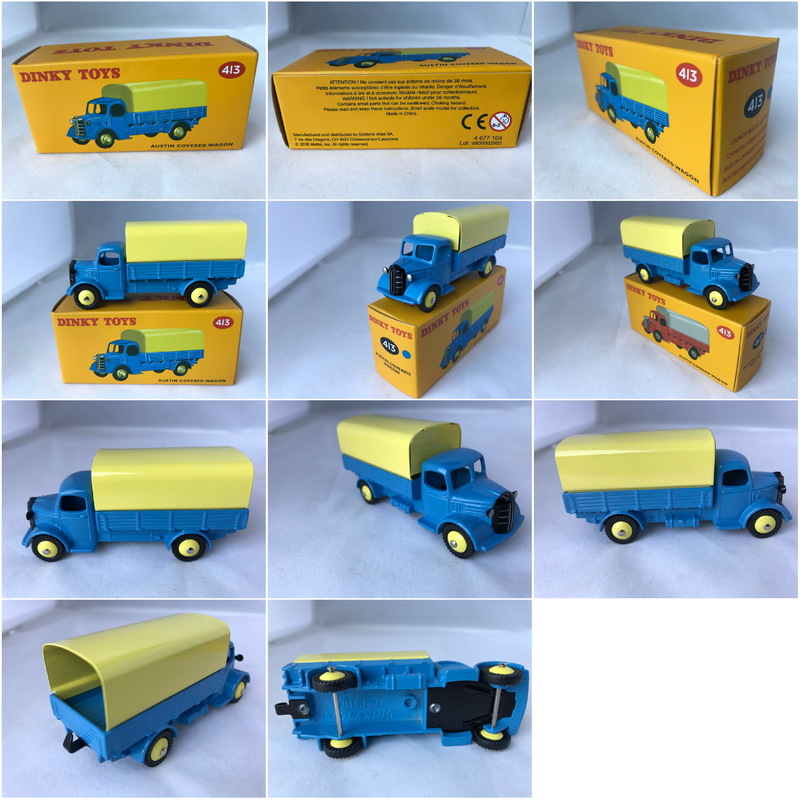 Dinky Toys by Atlas Editions #32AB Tracteur Panhard et Semi-remorque S.N.C.F (Blue). 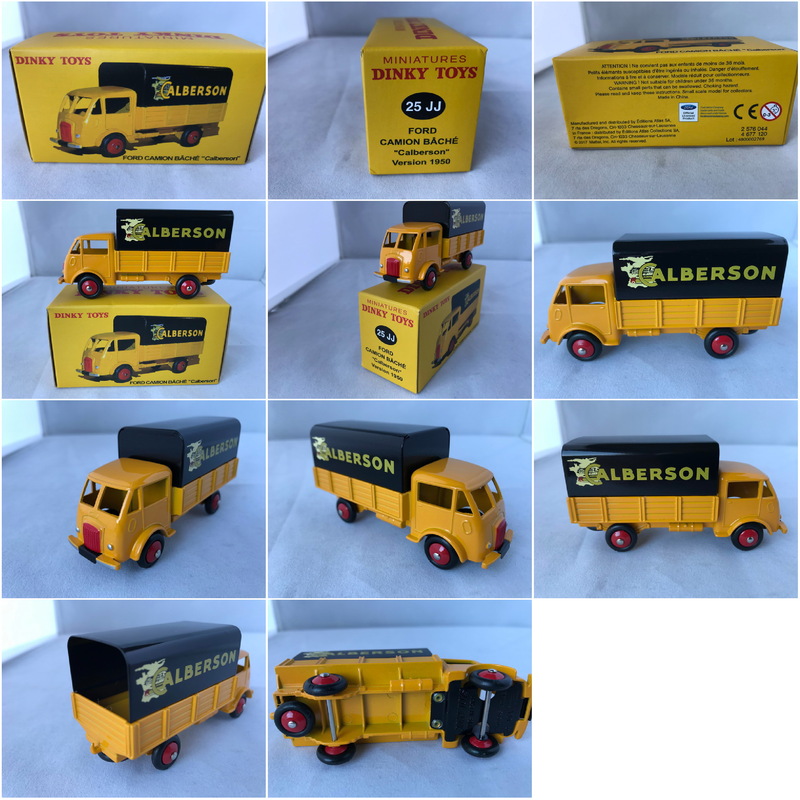 Dinky Toys by Atlas Editions #32AN Tracteur Panhard et Semi-remorque Baché "CALBERSON" (Yellow). 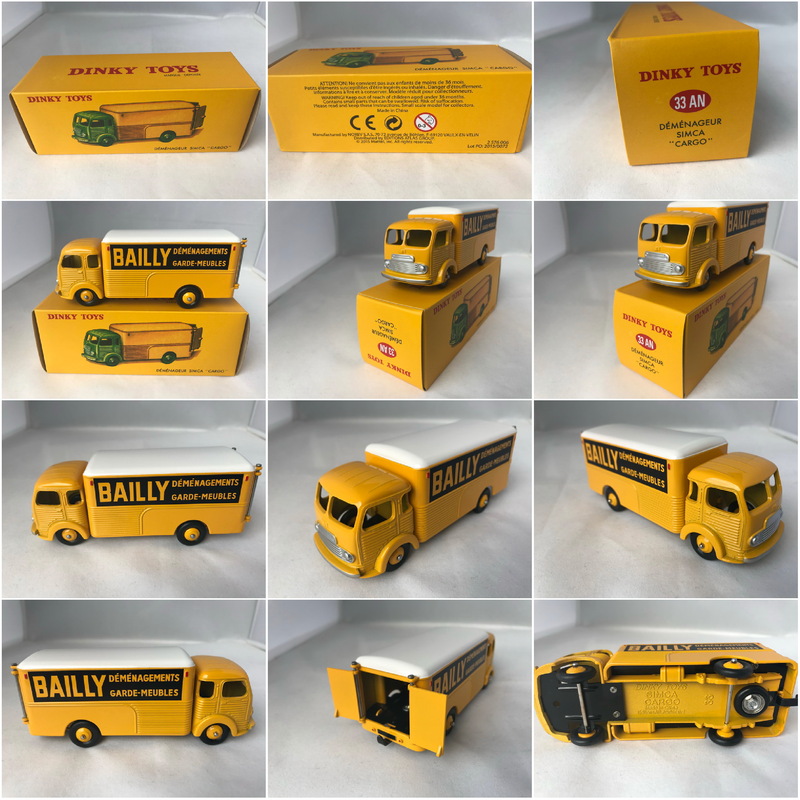 Dinky Toys by Atlas Editions #33AN Simca Déménageur "Cargo" BAILLY (Yellow). 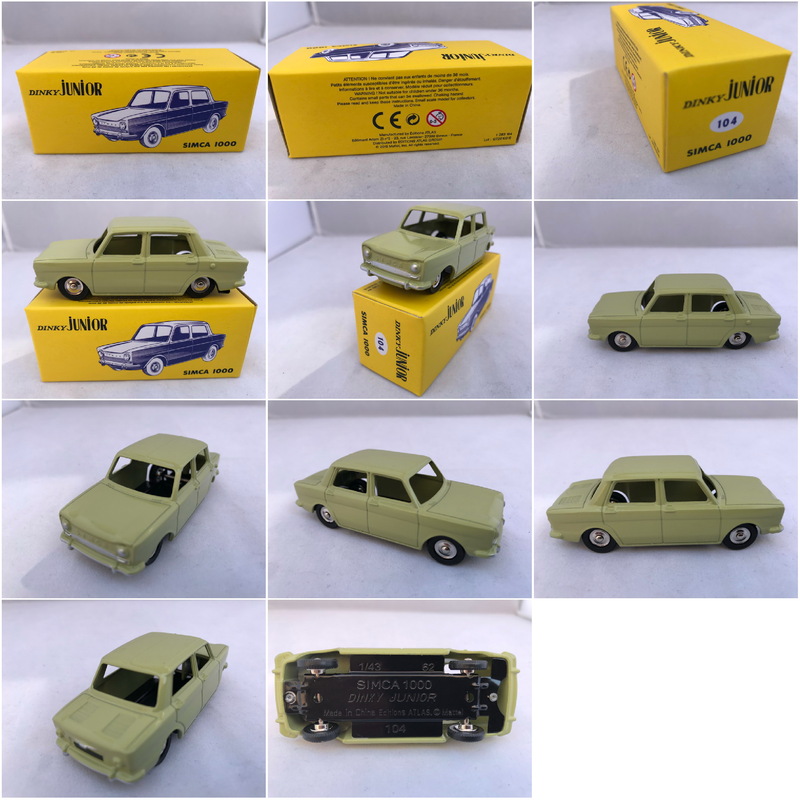 Dinky Toys by Atlas Editions #33B Simca Benne Basculante "Cargo" (Green). 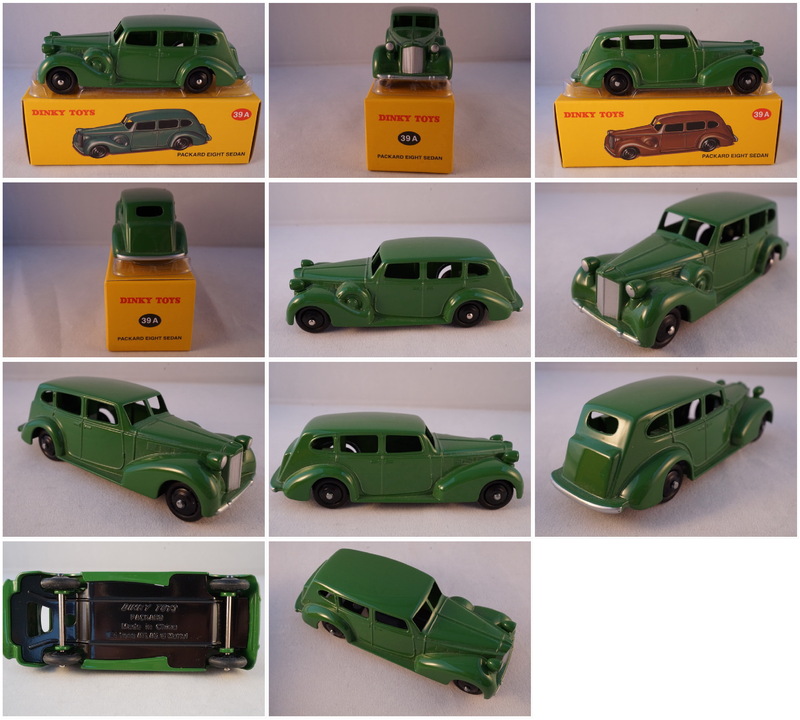 Dinky Toys by Atlas Editions #39A Packard Eight Sedan (Green). 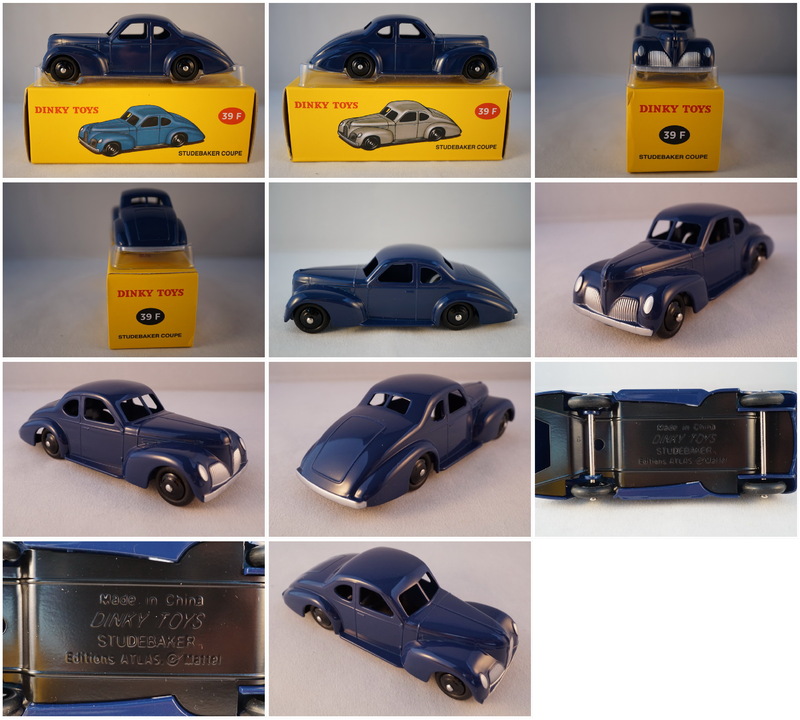 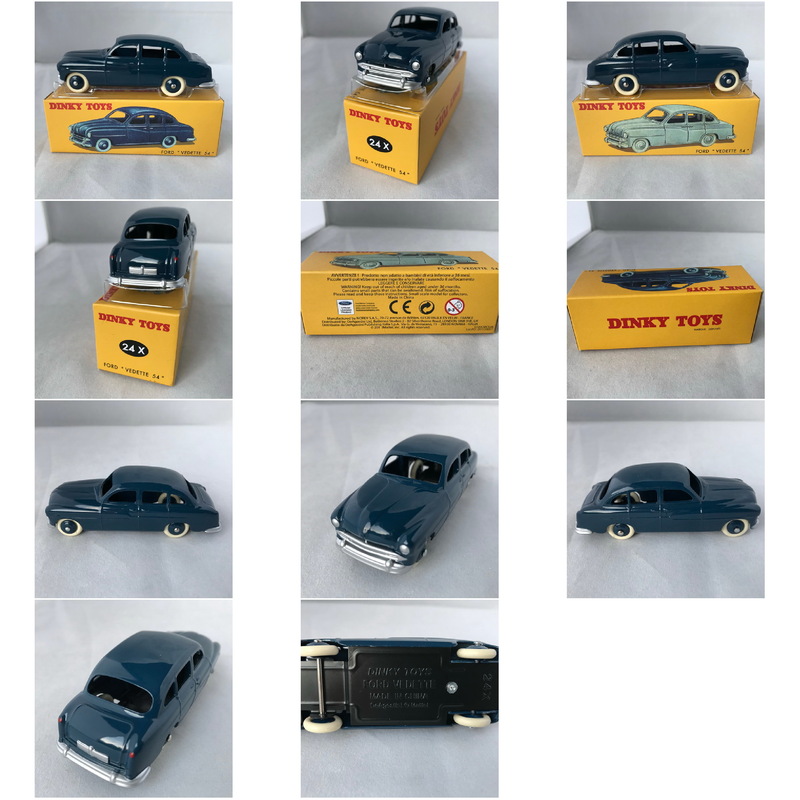 Dinky Toys by Atlas Editions #39F Studebaker Coupe (Blue). 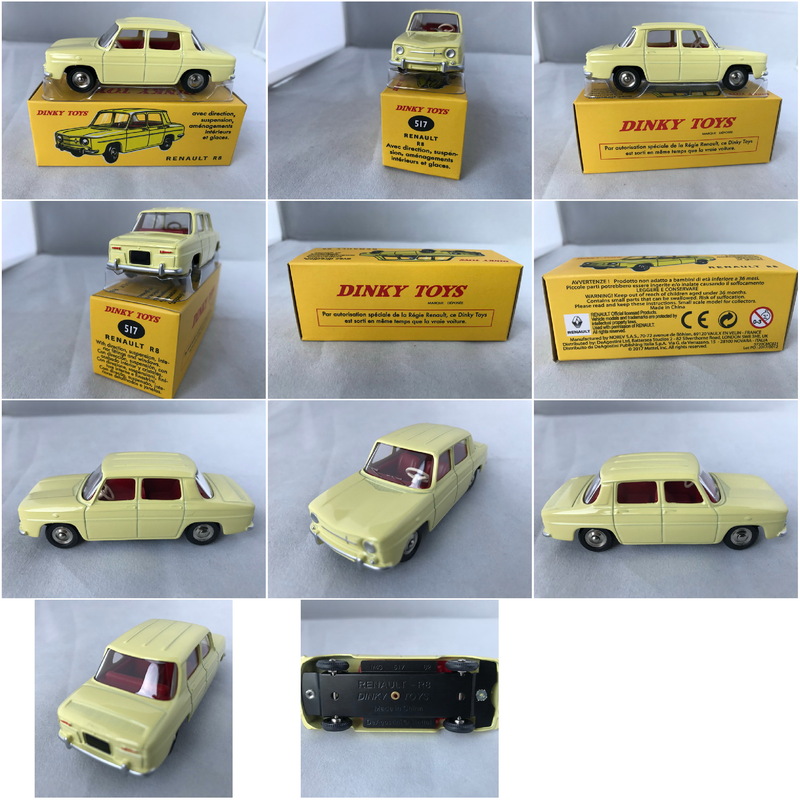 Dinky Toys Junior by Atlas Editions #104 Simca 1000 (Olive green). 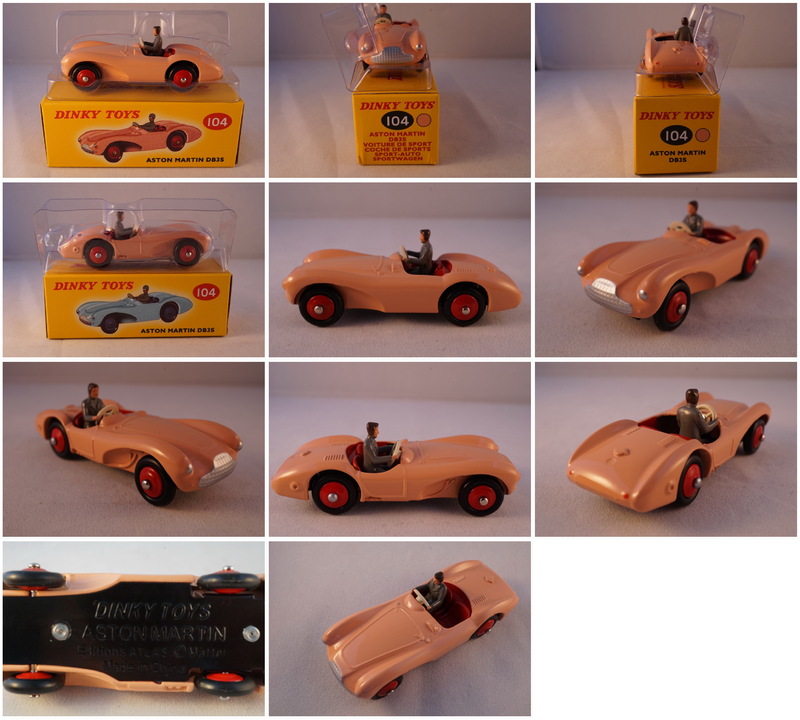 Dinky Toys by Atlas Editions #104 Aston Martin DB3S (Pink). 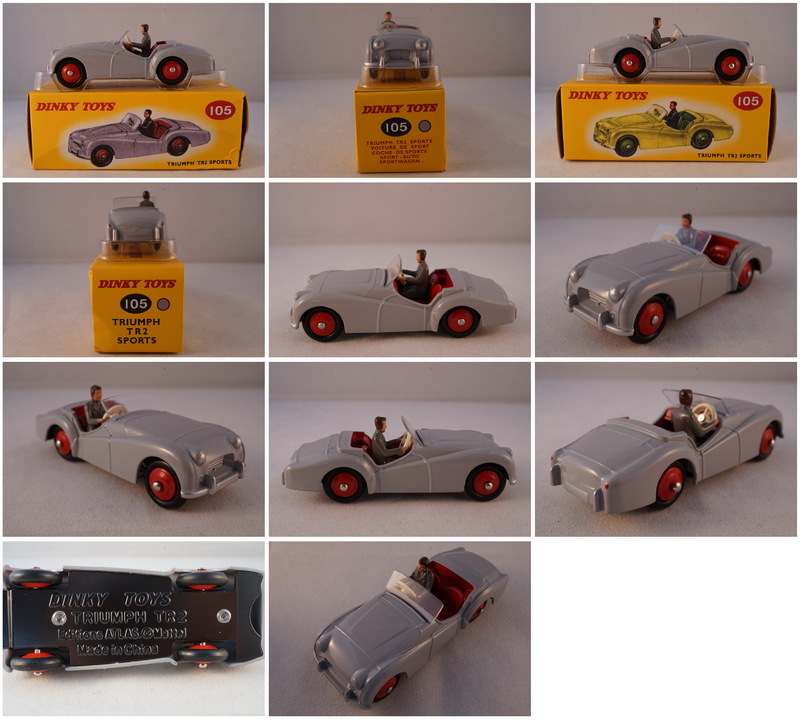 Dinky Toys by Atlas Editions #105 Triumph TR2 (Grey). 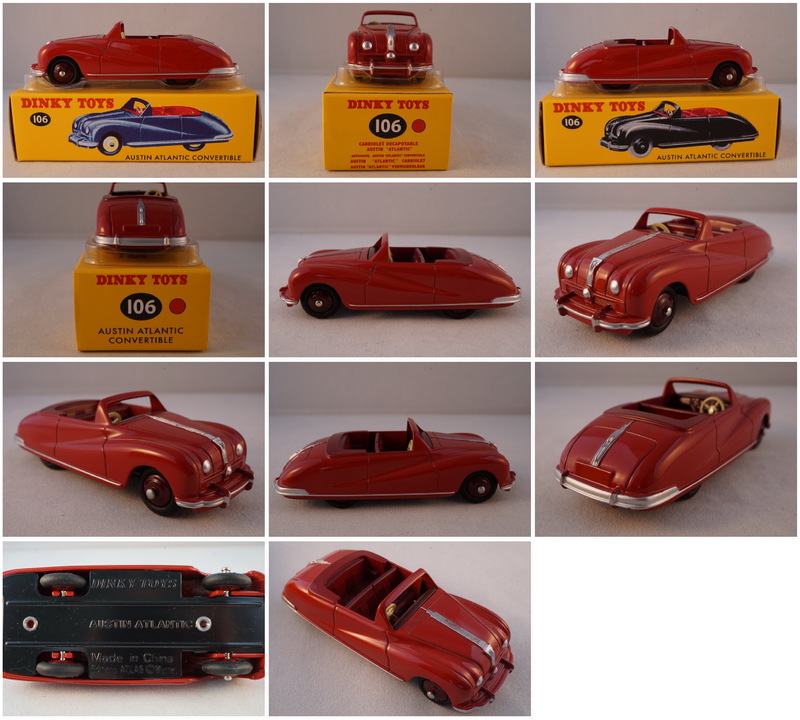 Dinky Toys by Atlas Editions #106 Austin Atlantic convertible (Red). 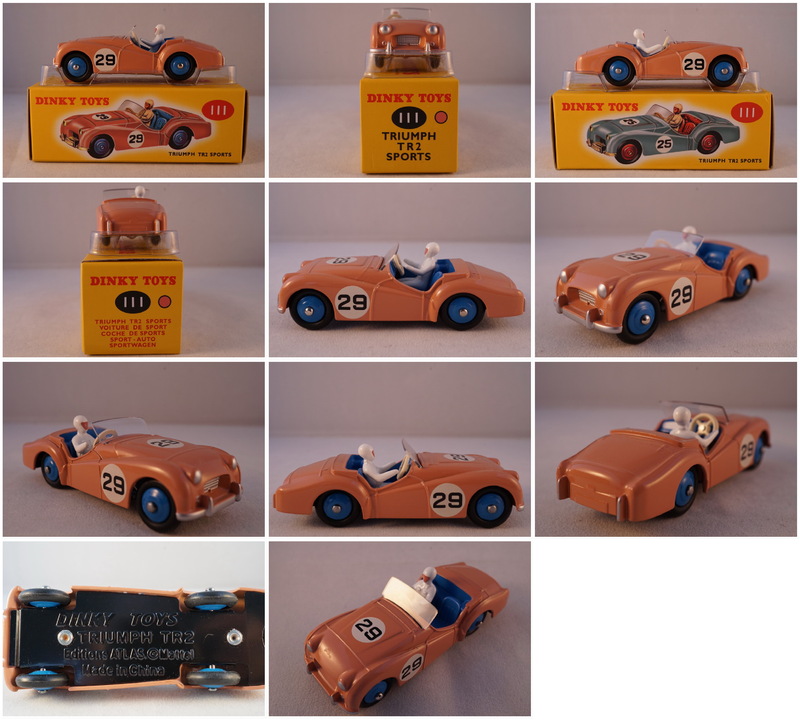 Dinky Toys by Atlas Editions #111 Triumph TR2 Sports #29 (Pink). 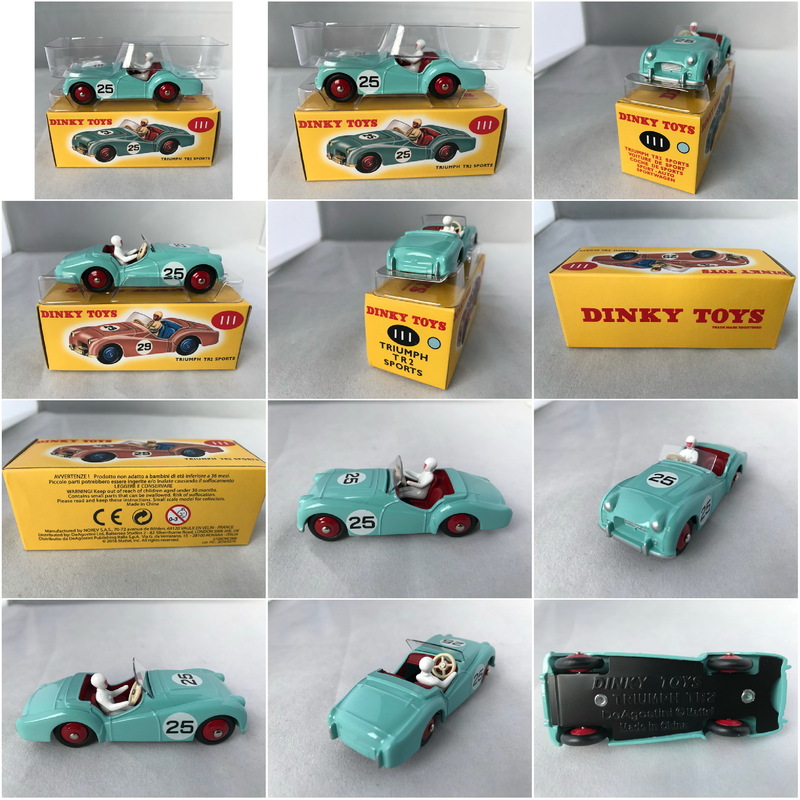 Dinky Toys by DeAgostini #111 Triumph TR2 Sports #25 (Blue). Dinky Toys by Atlas Editions #157 Jaguar XK120 Coupe (Yellow/Grey). 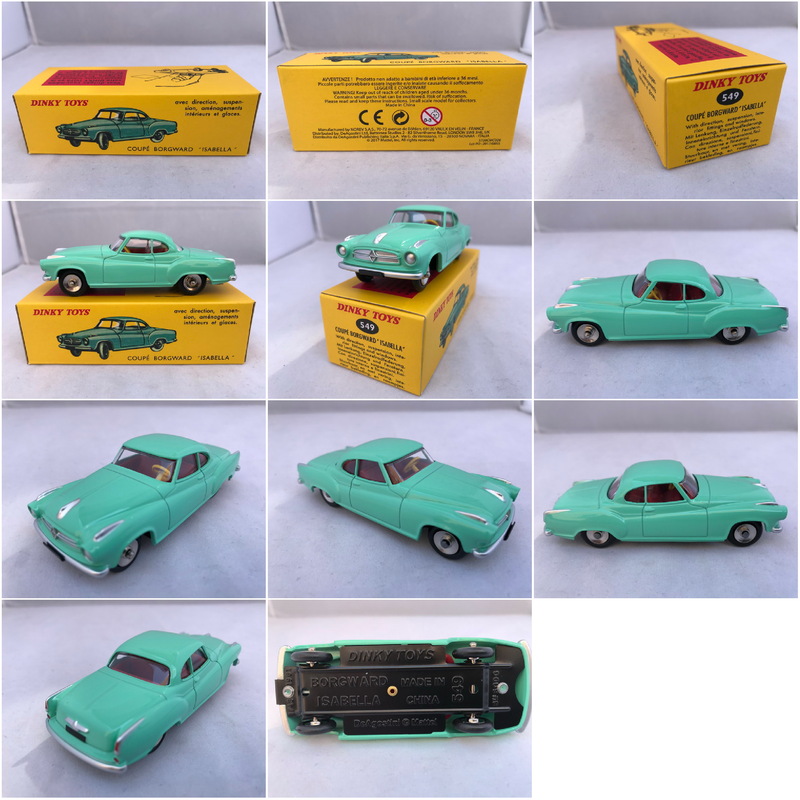 Dinky Toys by DeAgostini #157 Jaguar XK120 Coupe (Green). 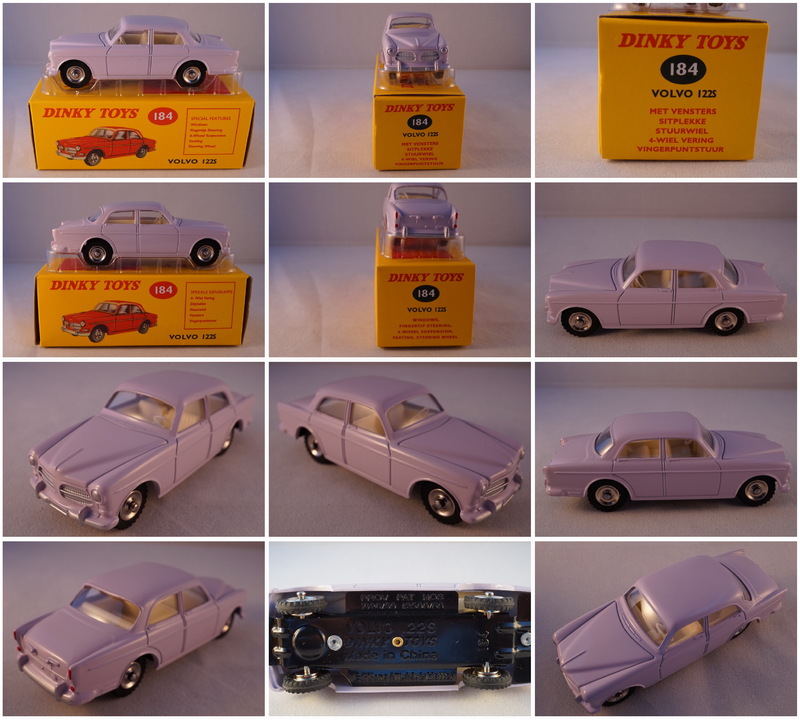 Dinky Toys by Atlas Editions #159 Morris Oxford saloon (Cerise/ Cream). 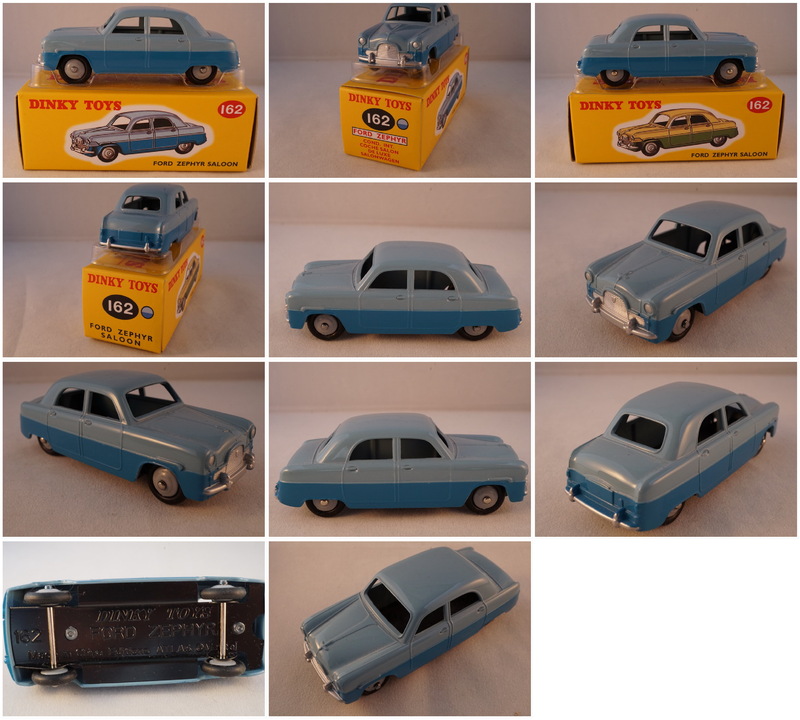 Dinky Toys by Atlas Editions #162 Ford Zephyr Saloon (Two tone blue). 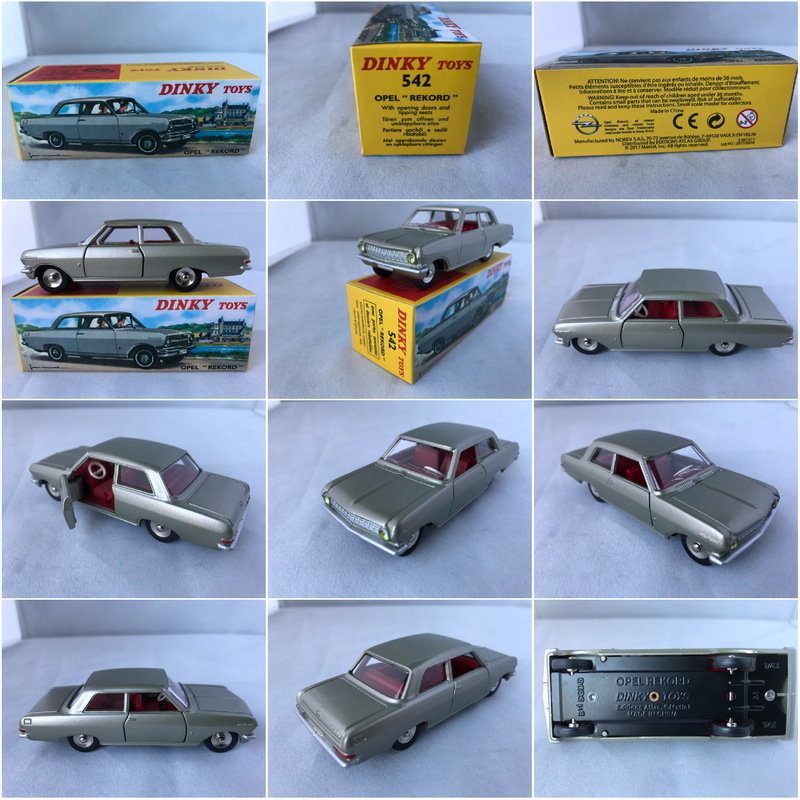 Dinky Toys by DeAgostini #177 Opel Kapitan (Blue). 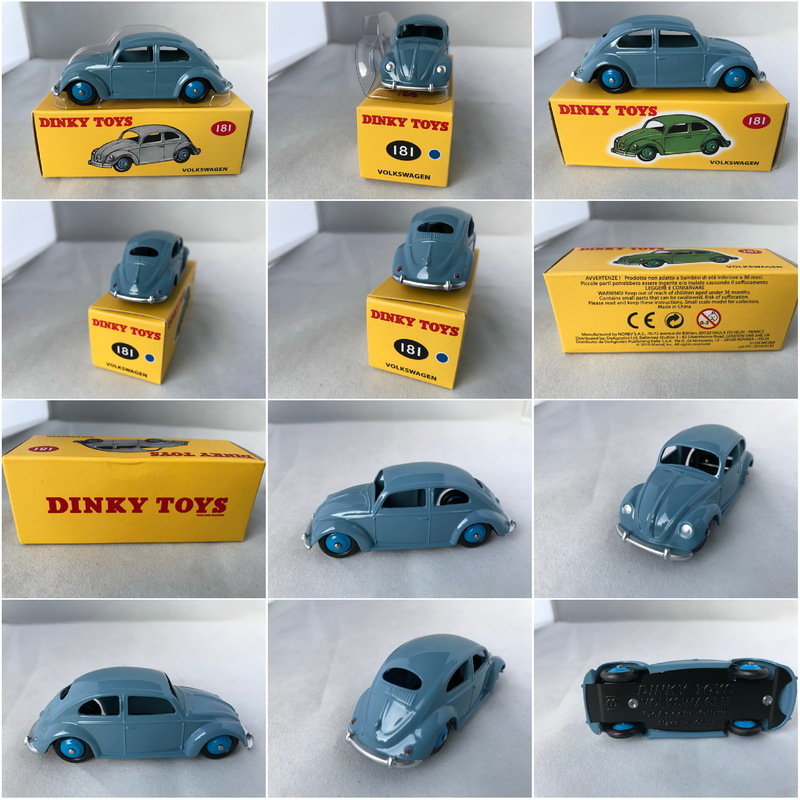 Dinky Toys by DeAgostini #181 Volkswagen beetle (Blue). 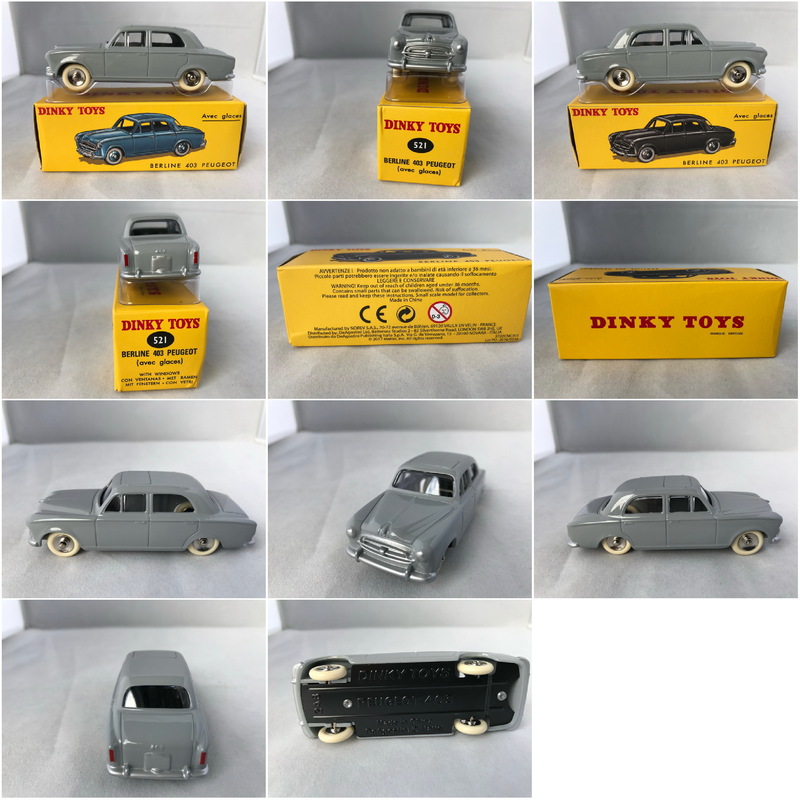 Dinky Toys by Atlas Editions #184 Volvo 122S Amazon (Lila). 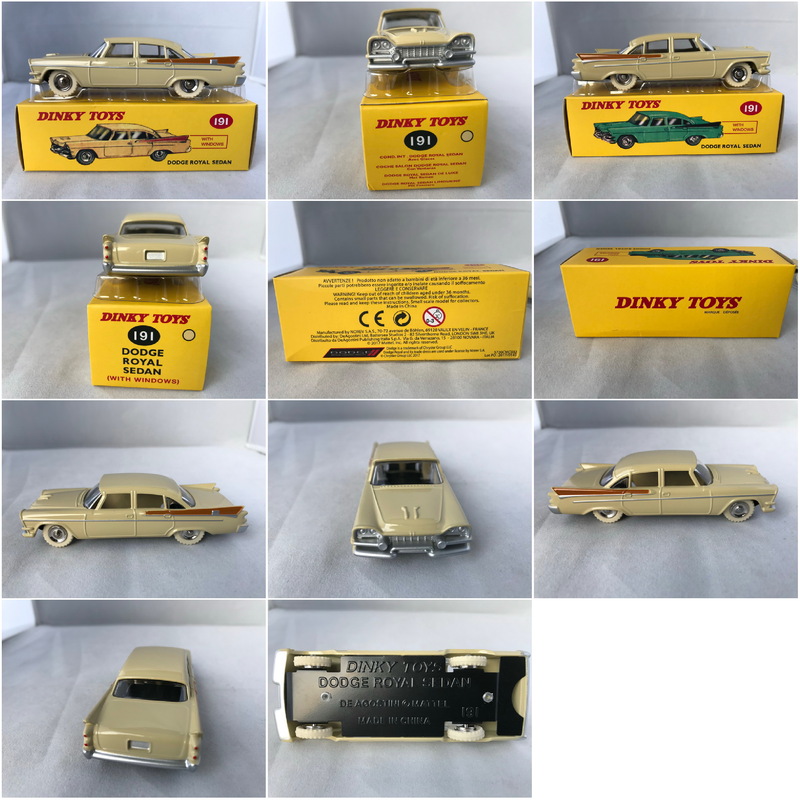 Dinky Toys by DeAgostini #191 Dodge Royal sedan 1955 (Taupe). 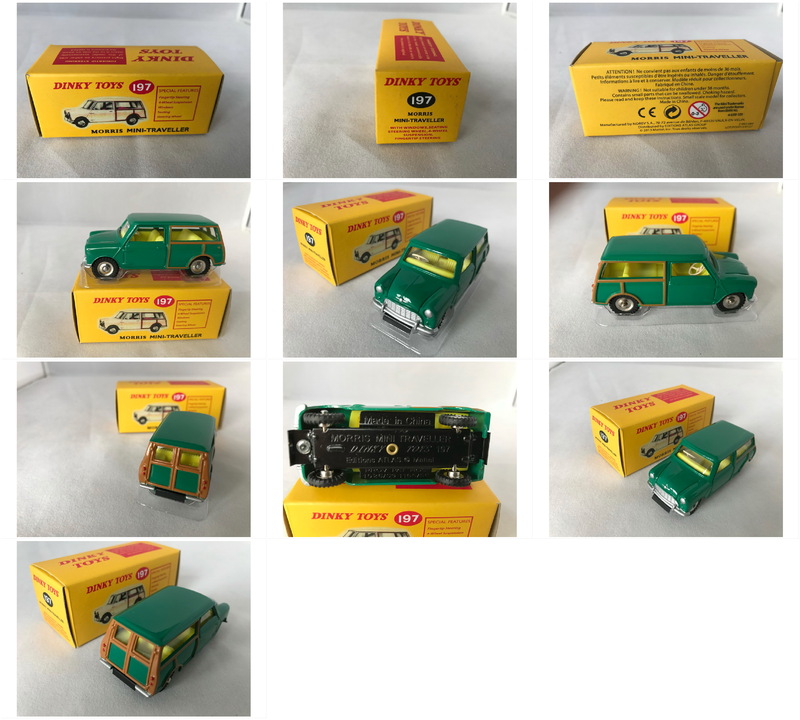 Dinky Toys by Atlas Editions #197 Morris mini traveller (Green). 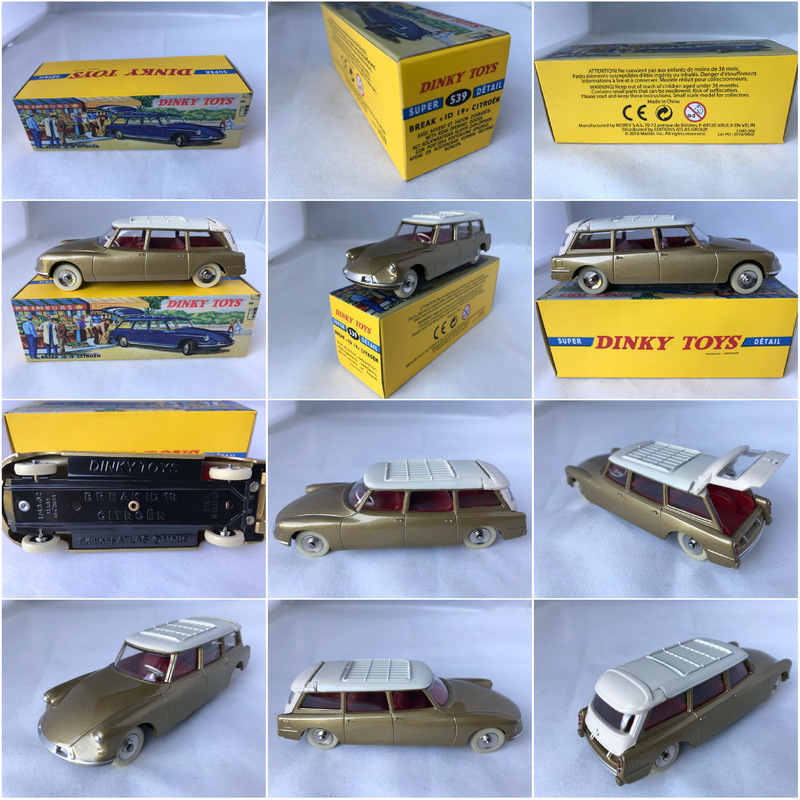 Dinky Toys by DeAgostini #197 Morris mini traveller (Beige). 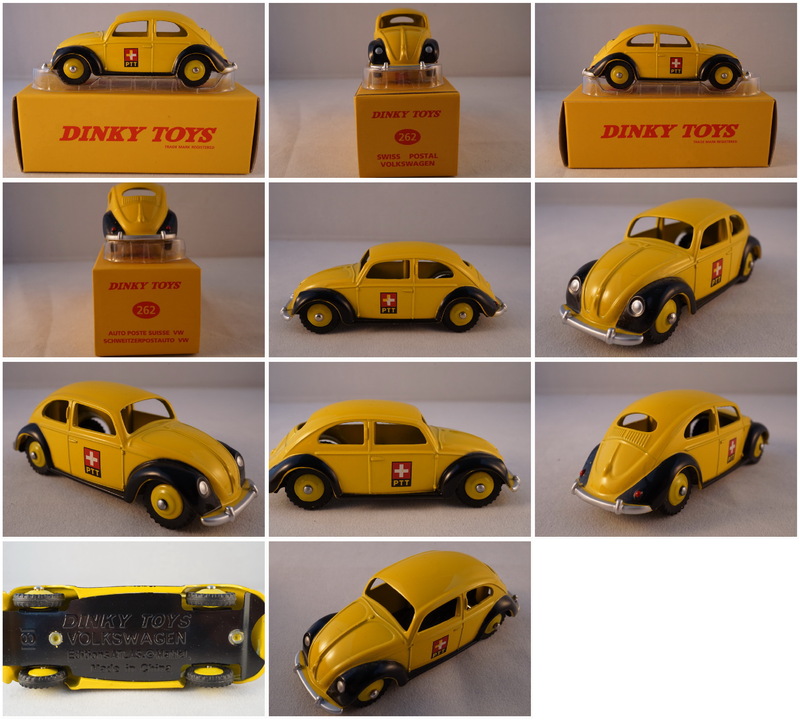 Dinky Toys by Atlas Editions #262 Swiss Postal Volkswagen (Yellow, black fenders). 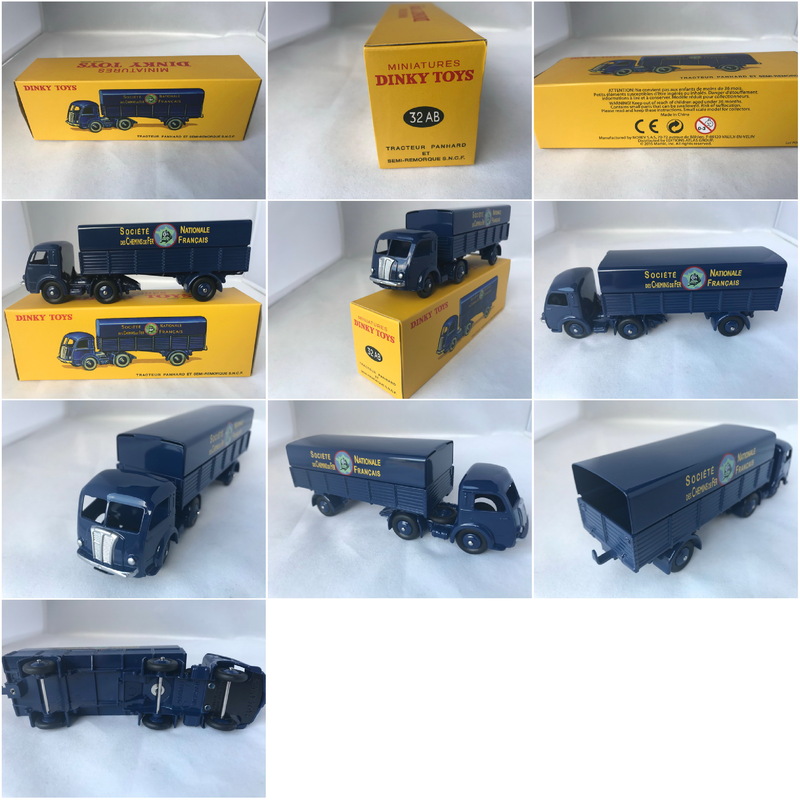 Dinky Toys by Atlas Editions #413 Austin covered wagon (Blue/Yellow). 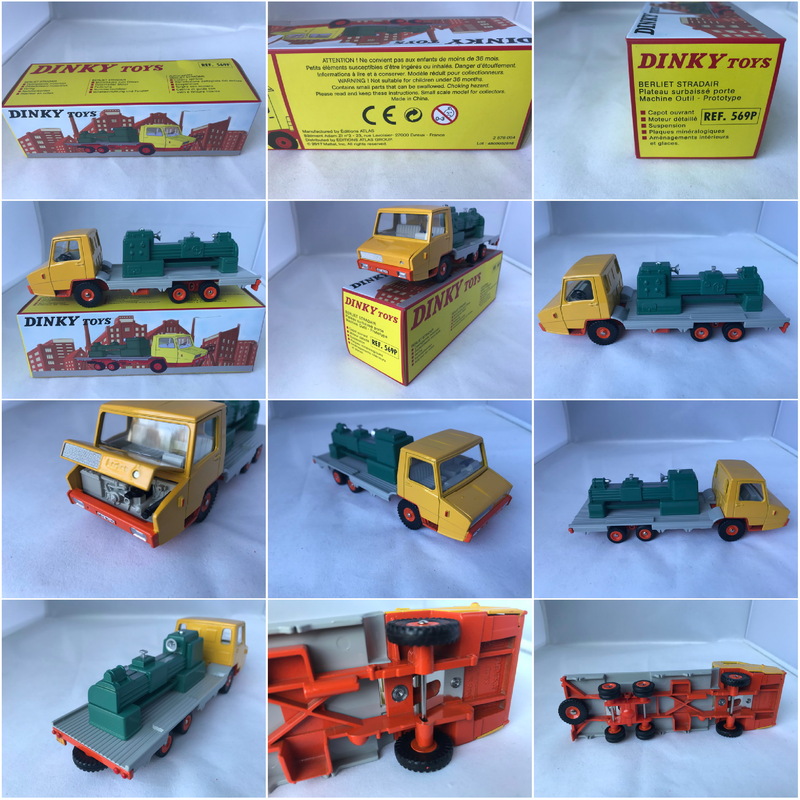 Dinky Toys by Atlas Editions #435 Bedford TK Tipper (Grey/Blue/Orange). 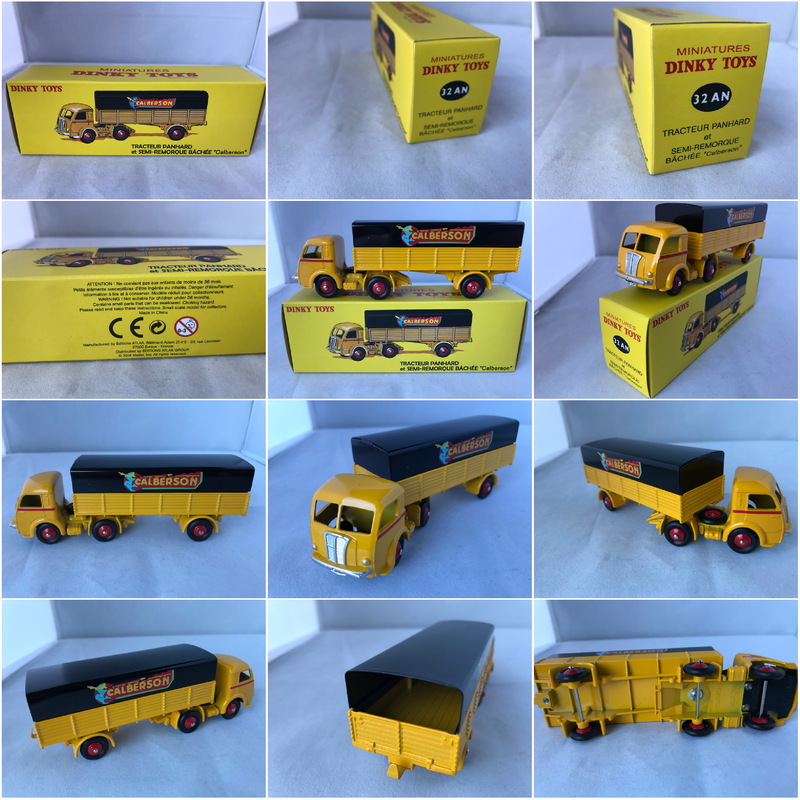 Dinky Toys by DeAgostini #480 Bedford cwt Van "Kodak" (Yellow). 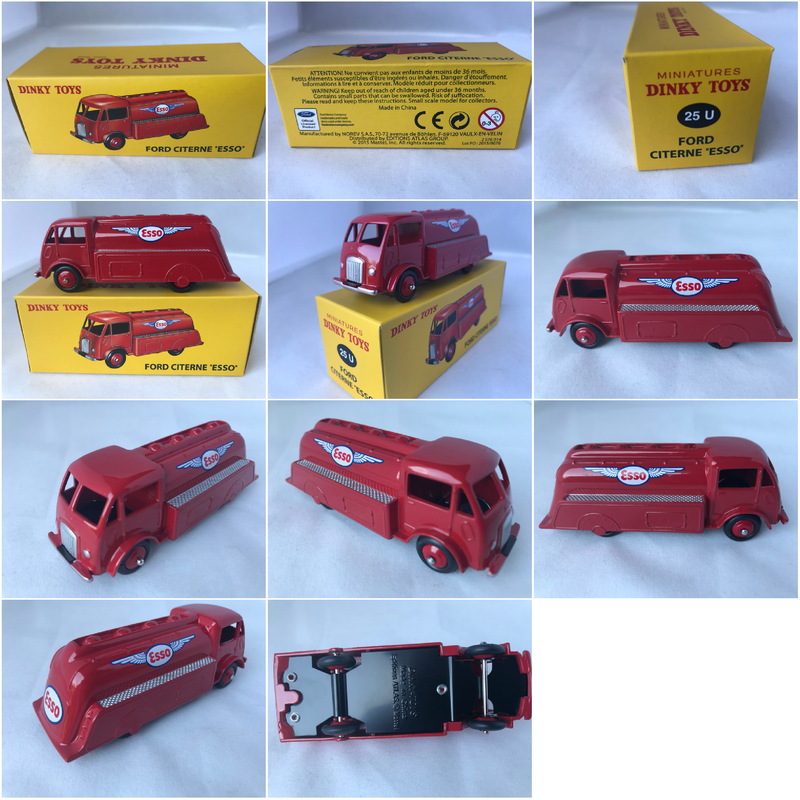 Dinky Toys by DeAgostini #481 Bedford 10 cwt Van "OVALTINE" (Blue). 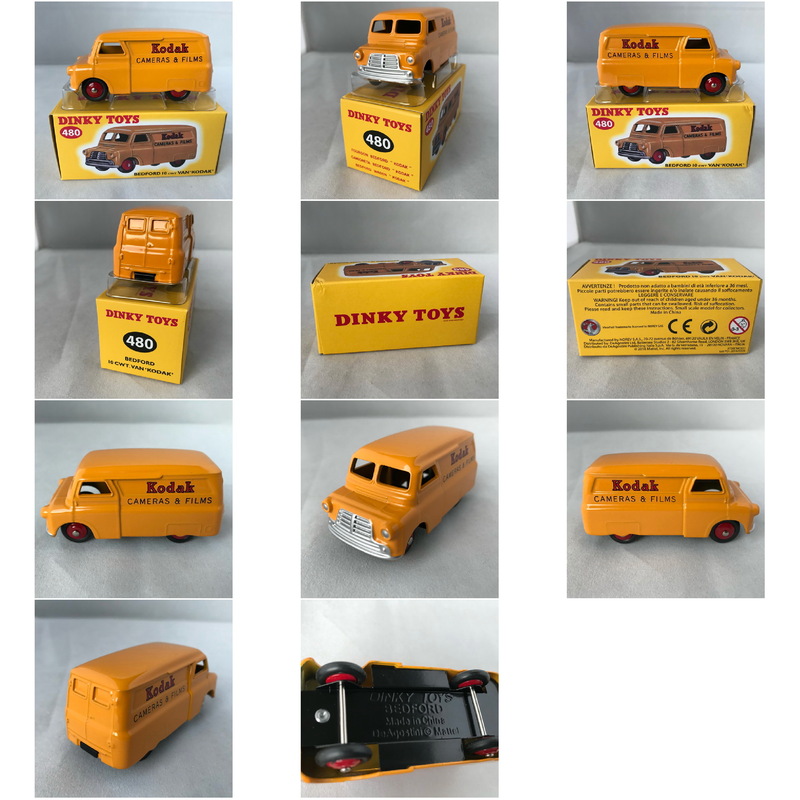 Dinky Toys by DeAgostini #482 Bedford 10 cwt Van "Dinky toys" (Orange/Yellow). 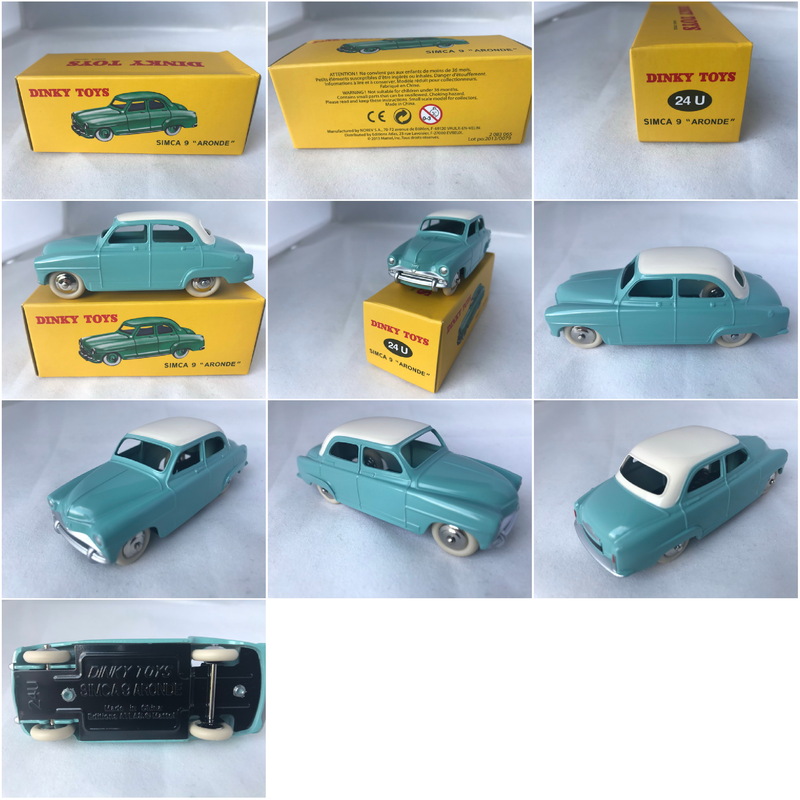 Dinky Toys by Atlas Editions #507 Simca 1500 break (White). 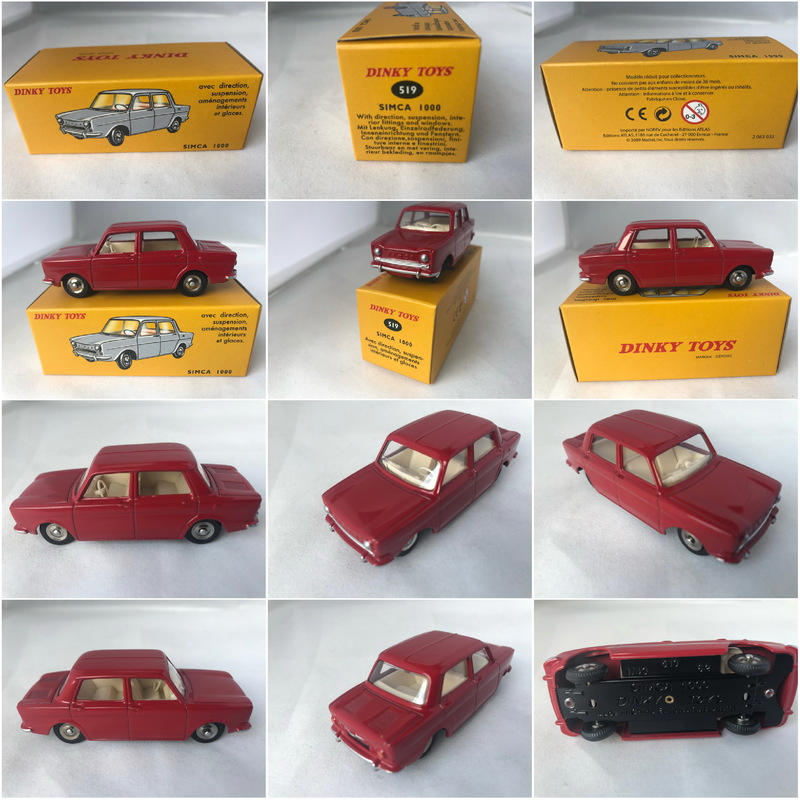 Dinky Toys by Atlas Editions #510 Peugeot 204 (metallic Red). 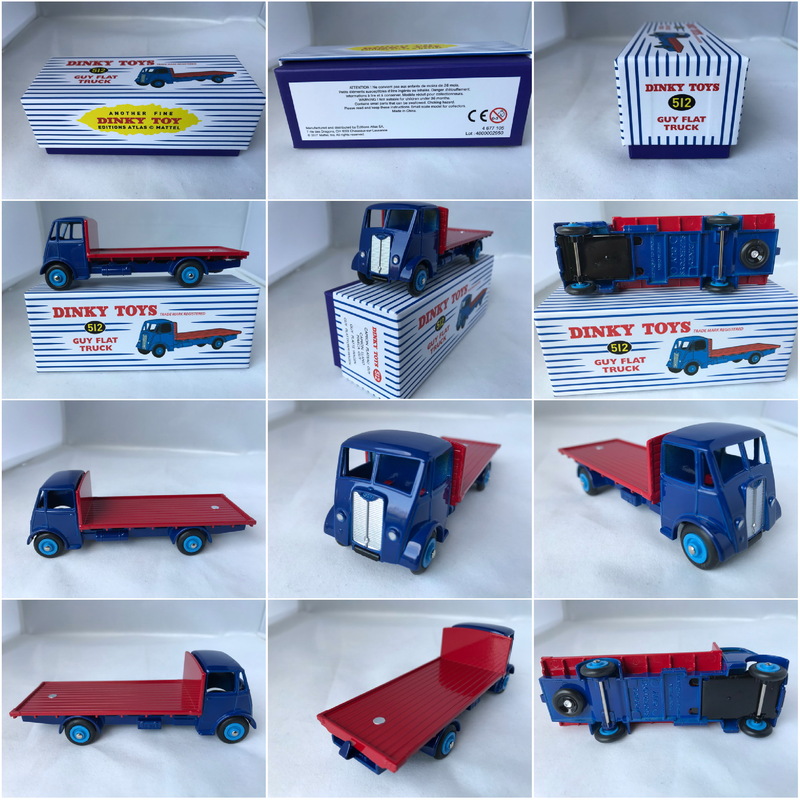 Dinky Toys by Atlas Editions #512 Guy Flat truck (Blue). 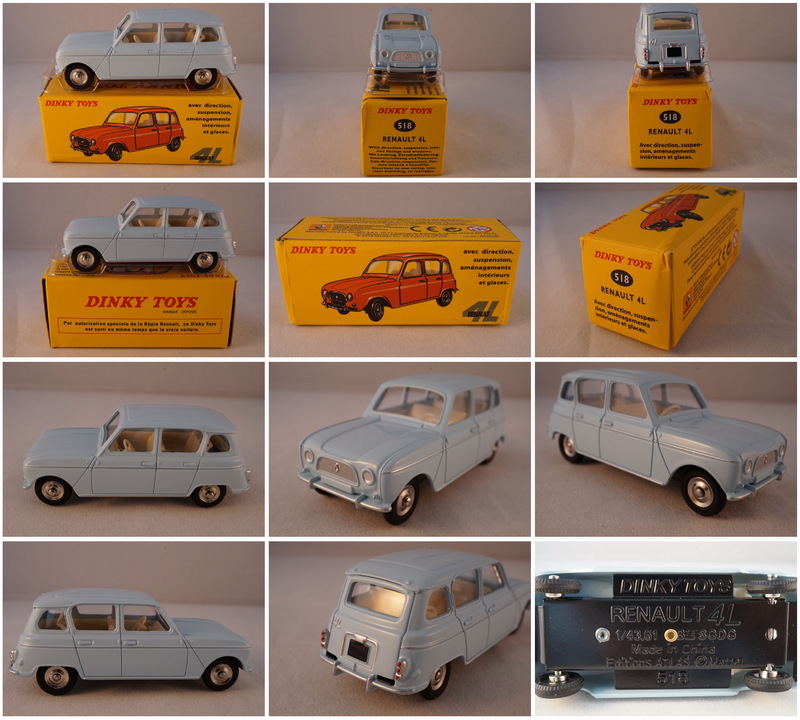 Dinky Toys by Atlas Editions #517 Renault R8 (Yellow). 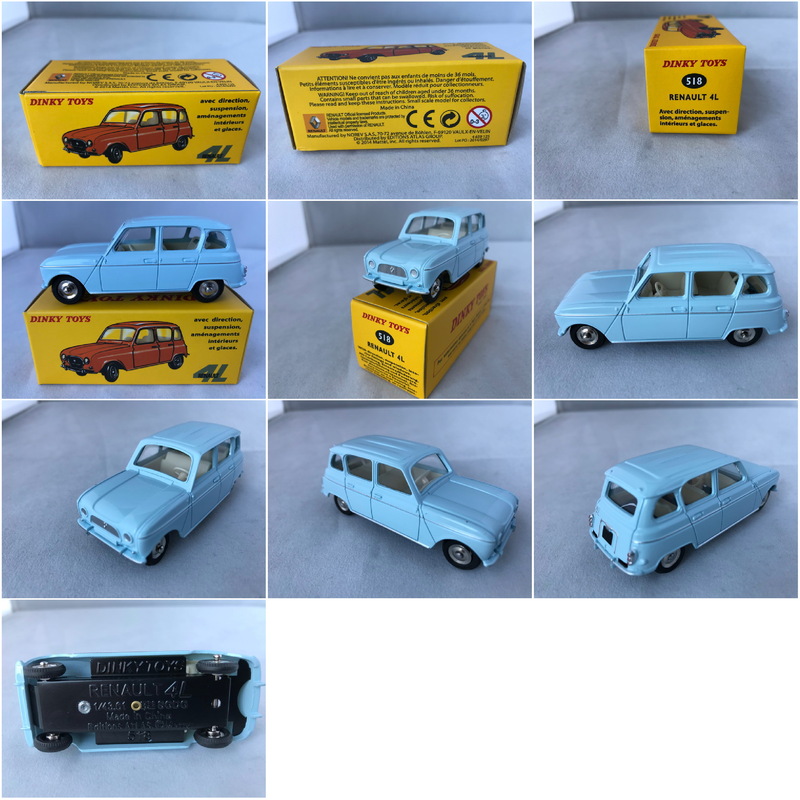 Dinky Toys by Atlas Editions #517 Renault R8 (Blue). 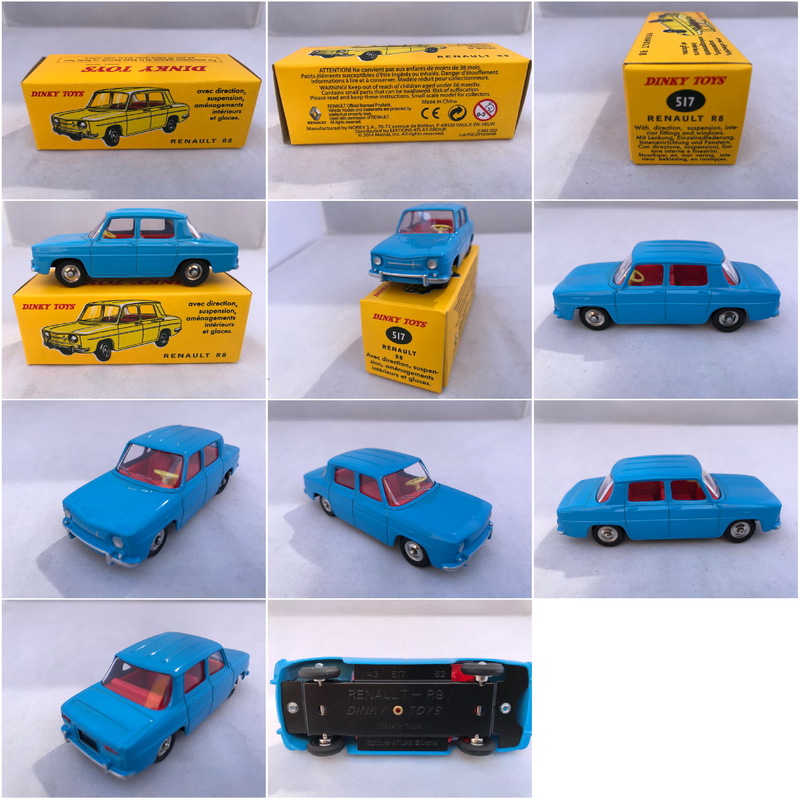 Dinky Toys by Atlas Editions #518 Renault 4L (Blue). 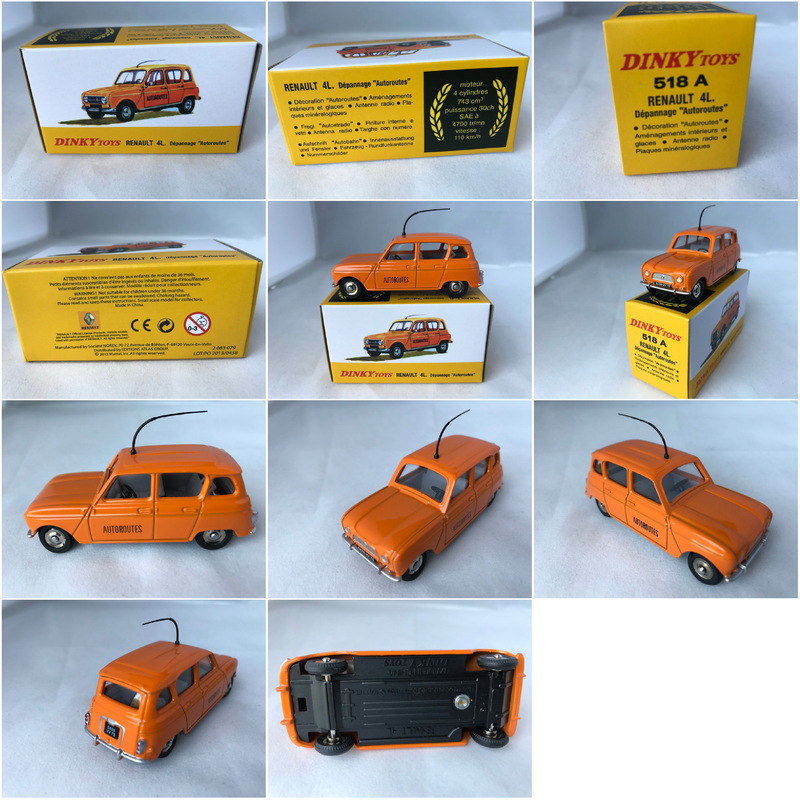 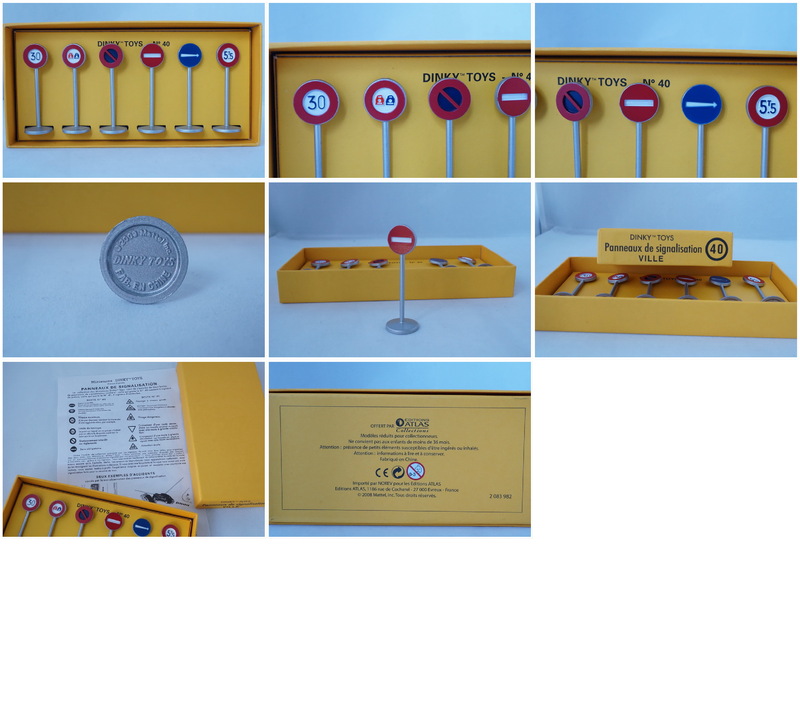 Dinky Toys by Atlas Editions #518a Renault 4L Depannage Äutoroutes" (Orange). 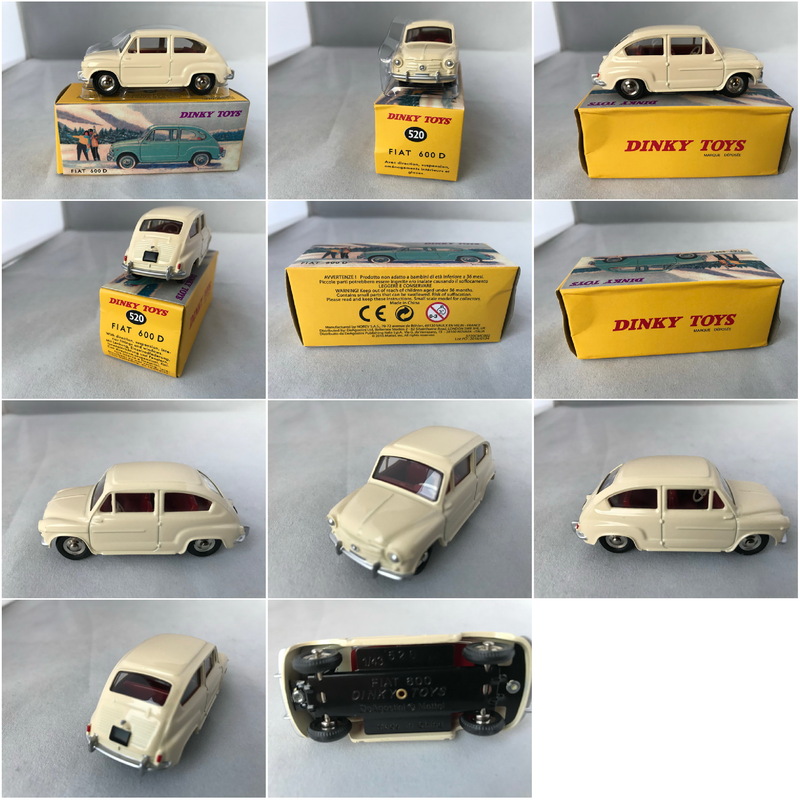 Dinky Toys by DeAgostini #520 Fiat 600D (White). 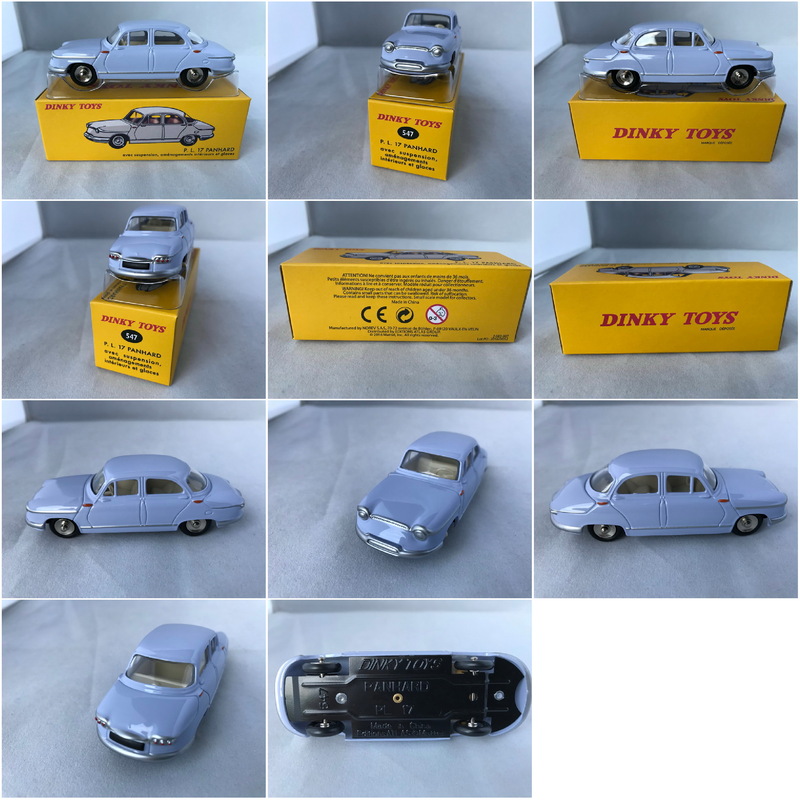 Dinky Toys by DeAgostini #521 Peugeot 403 Berline (Grey). 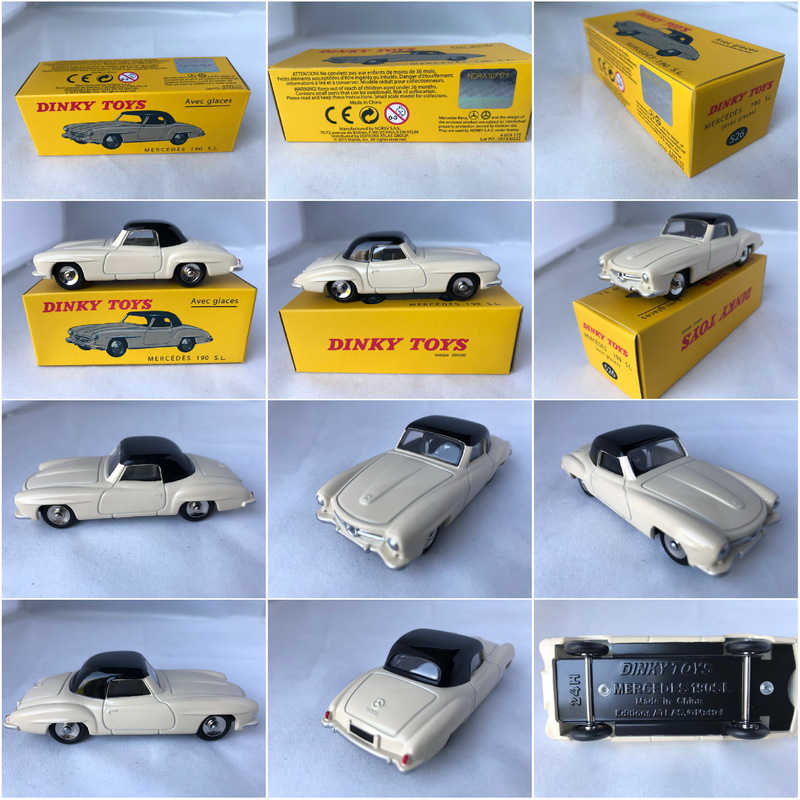 Dinky Toys by Atlas Editions #526 Mercedes 190SL (Grey/Black). 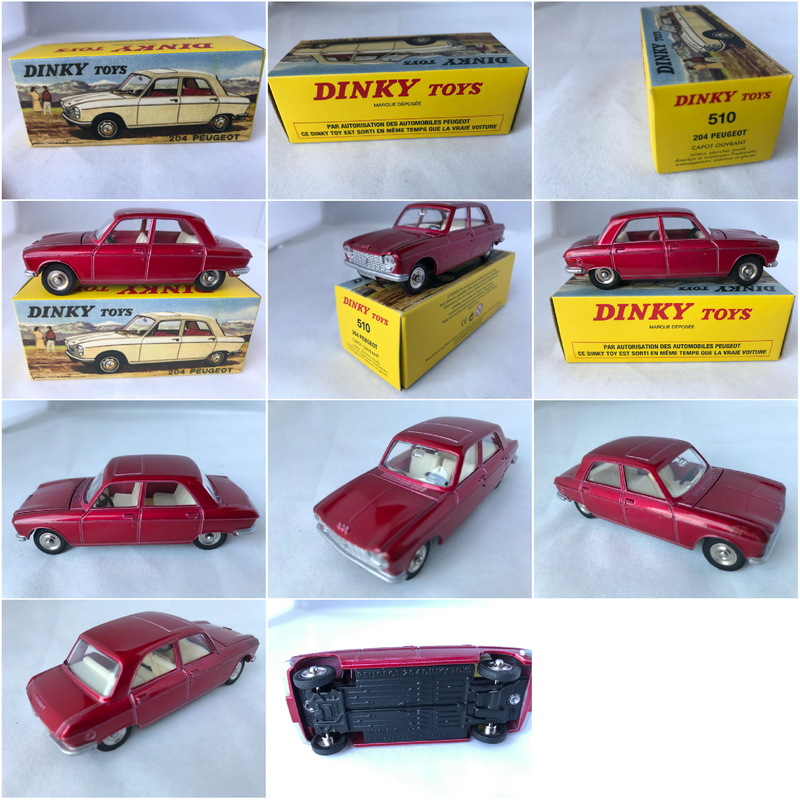 Dinky Toys by Atlas Editions #530 Citroen DS19 (dark Red/White). 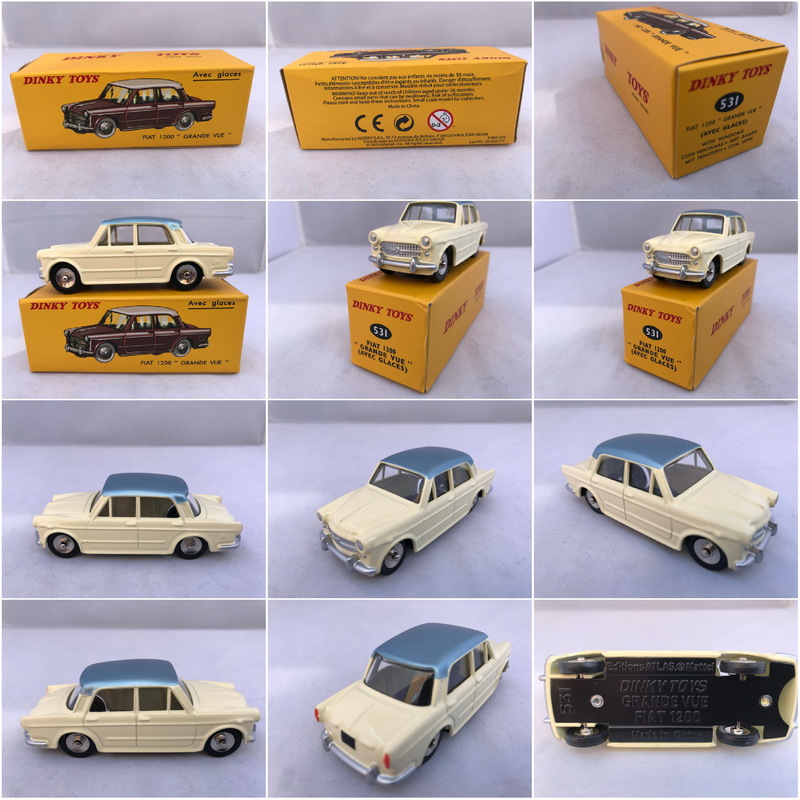 Dinky Toys by Atlas Editions #531 Fiat 1200 (Creme/Silver roof). 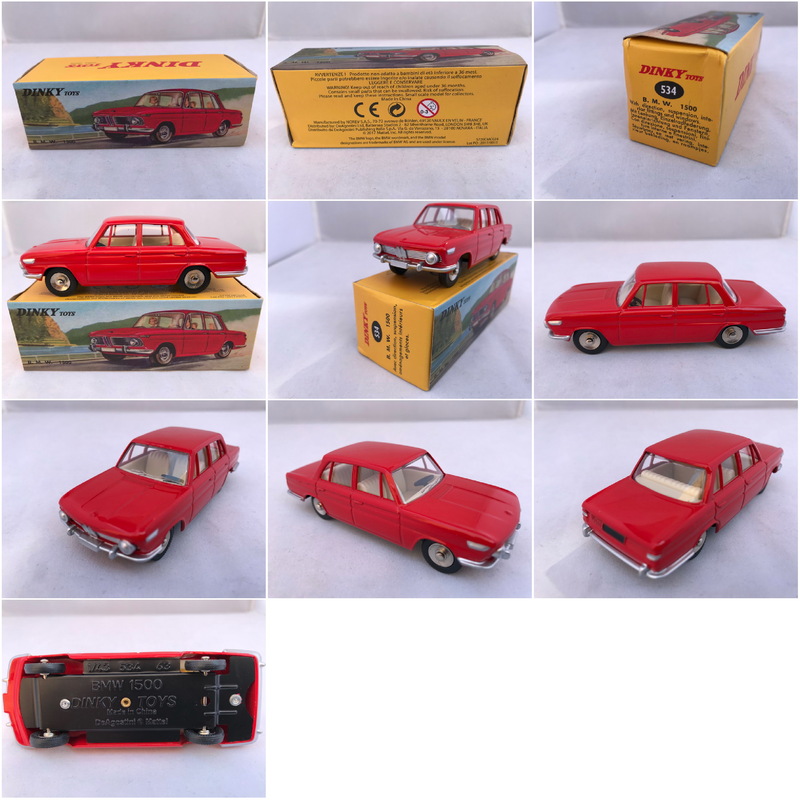 Dinky Toys by Atlas Editions #534 BMW 1500 (Red). 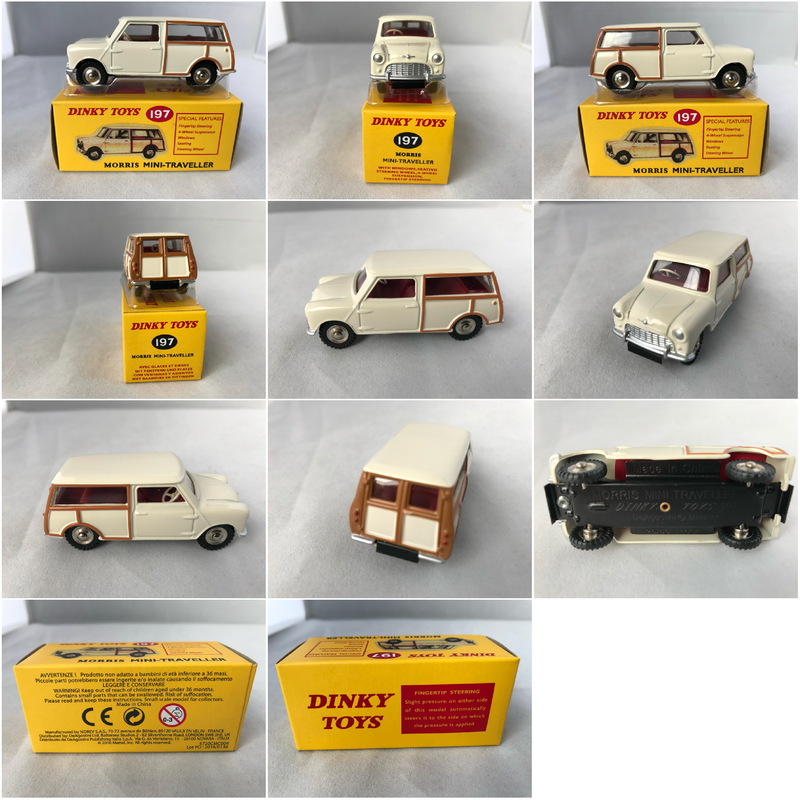 Dinky Toys by Atlas Editions #539 Citroen ID19 Break (Bronze/White). 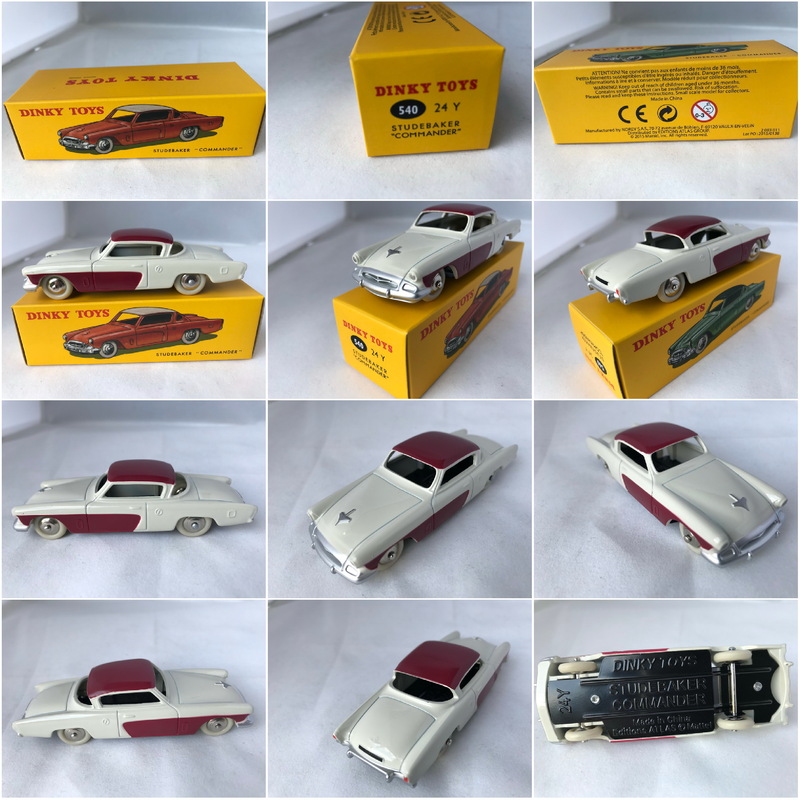 Dinky Toys by Atlas Editions #540 24Y Studebaker Commander (White/Purple). 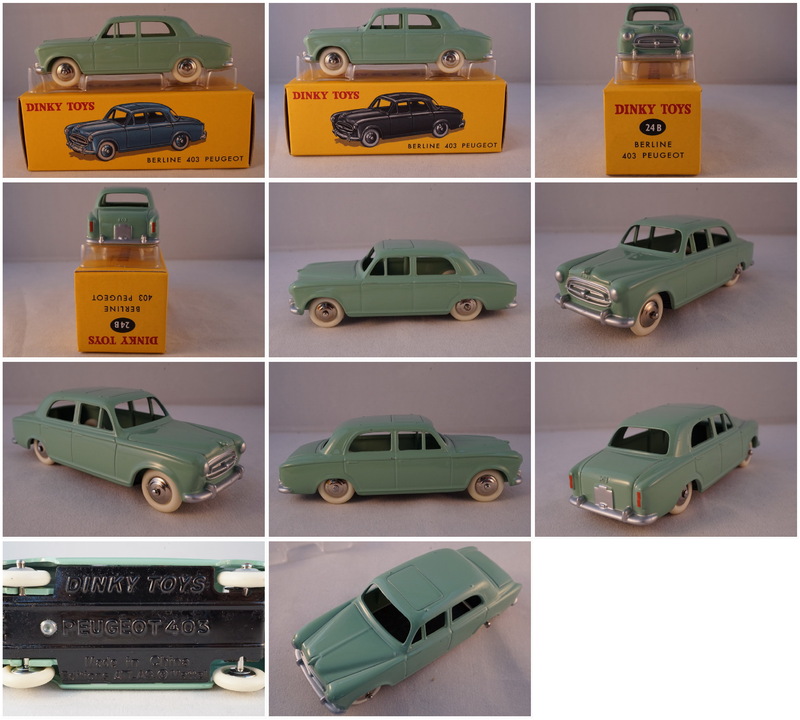 Dinky Toys by Atlas Editions #549 Borgward Isabella Coupé (pale Green). 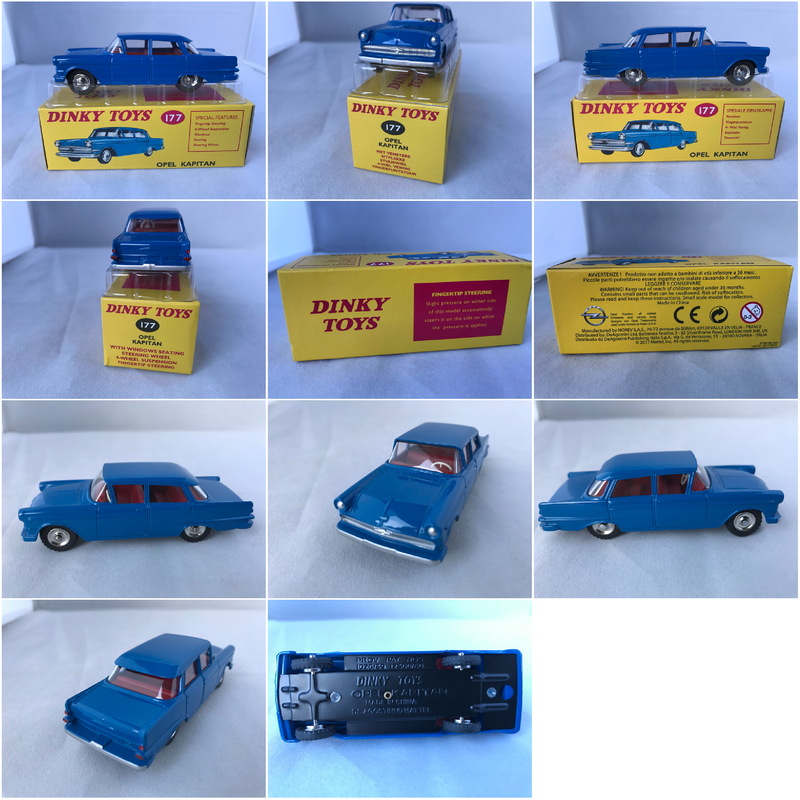 Dinky Toys by Atlas Editions #542 Opel Rekord 2 (Blue). 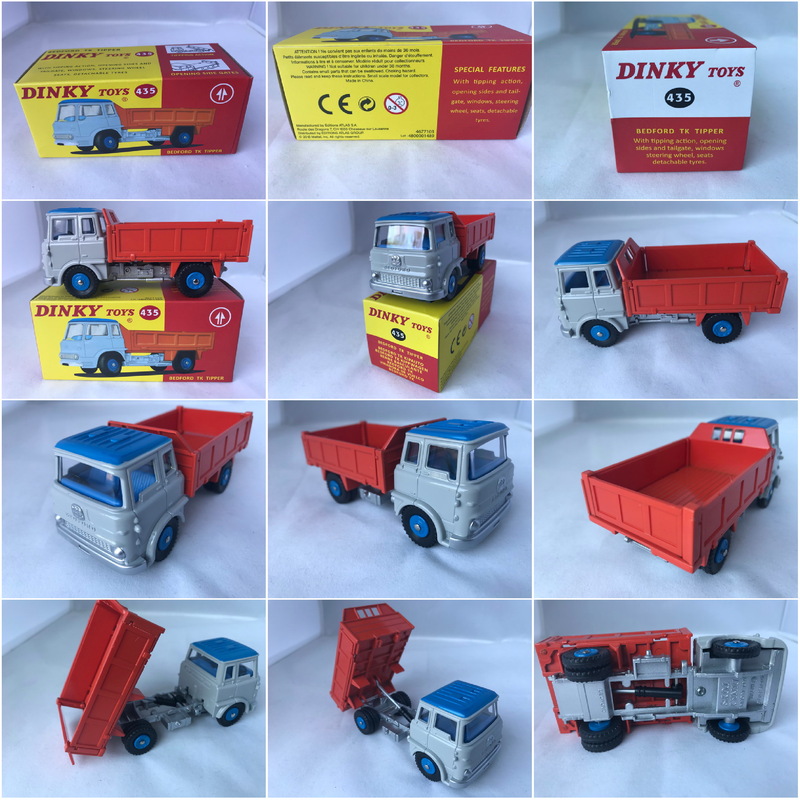 Dinky Toys by Atlas Editions #547 P.L. 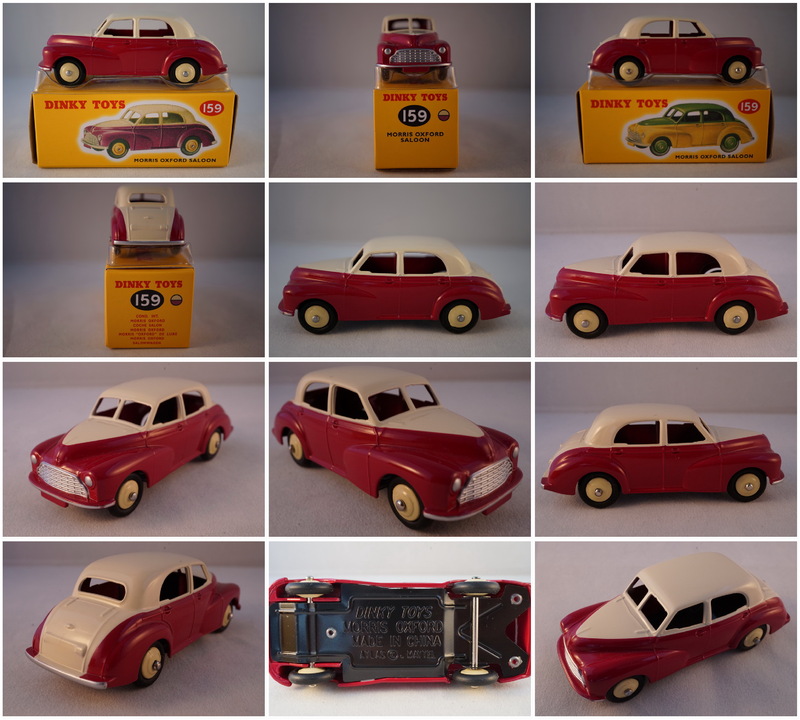 17 Panhard (Lila). 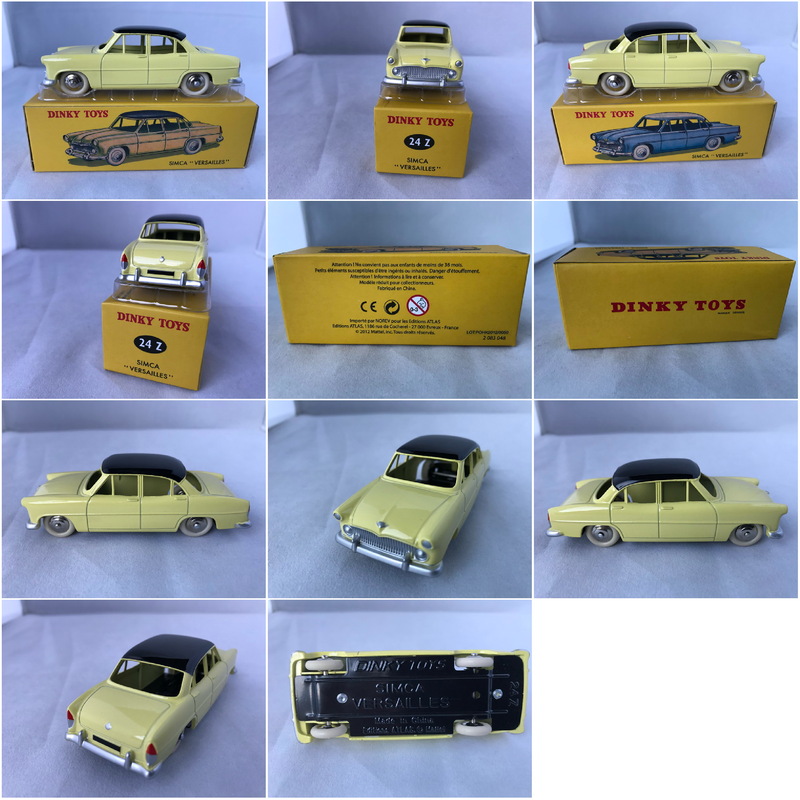 Dinky Toys by DeAgostini #548 Fiat 1800 Familiale (Yellow). 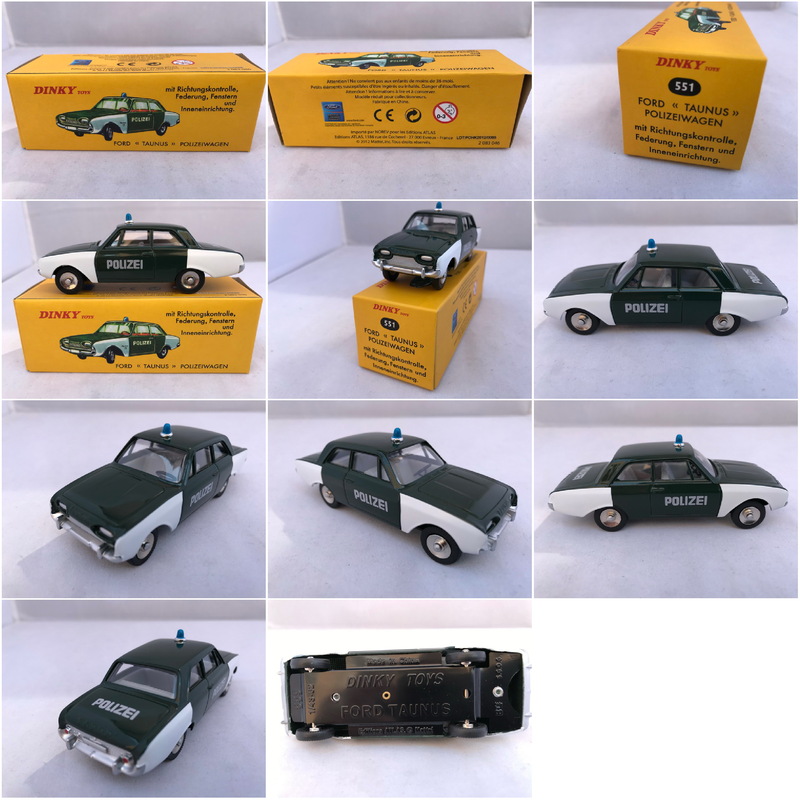 Dinky Toys by Atlas Editions #551 Ford Taunus Polizeiwagen (German Police) (Green/White). 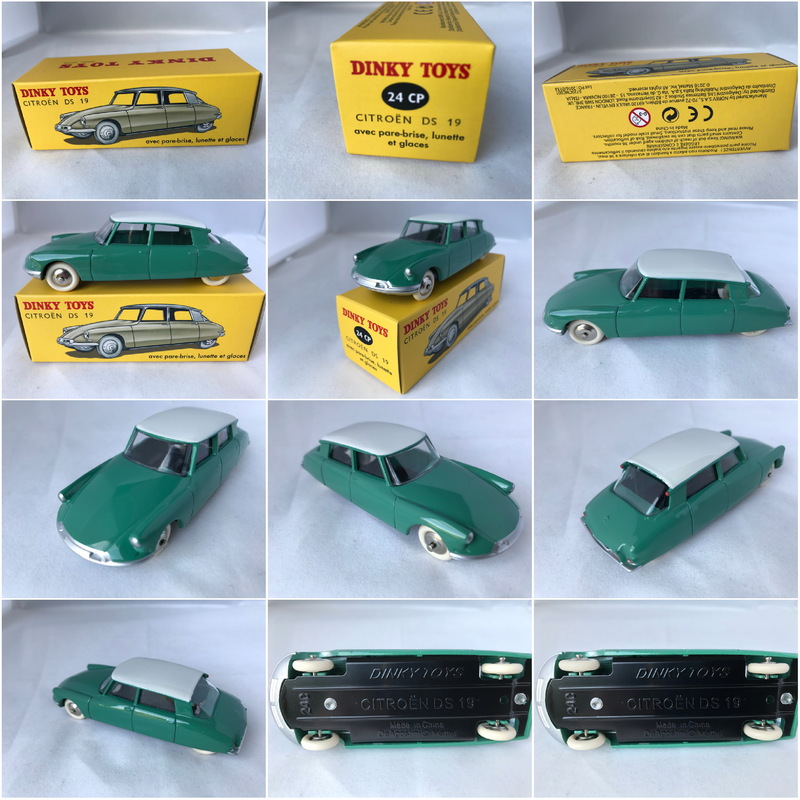 Dinky Toys by Atlas Editions #552 Chevrolet Corvair (Green). 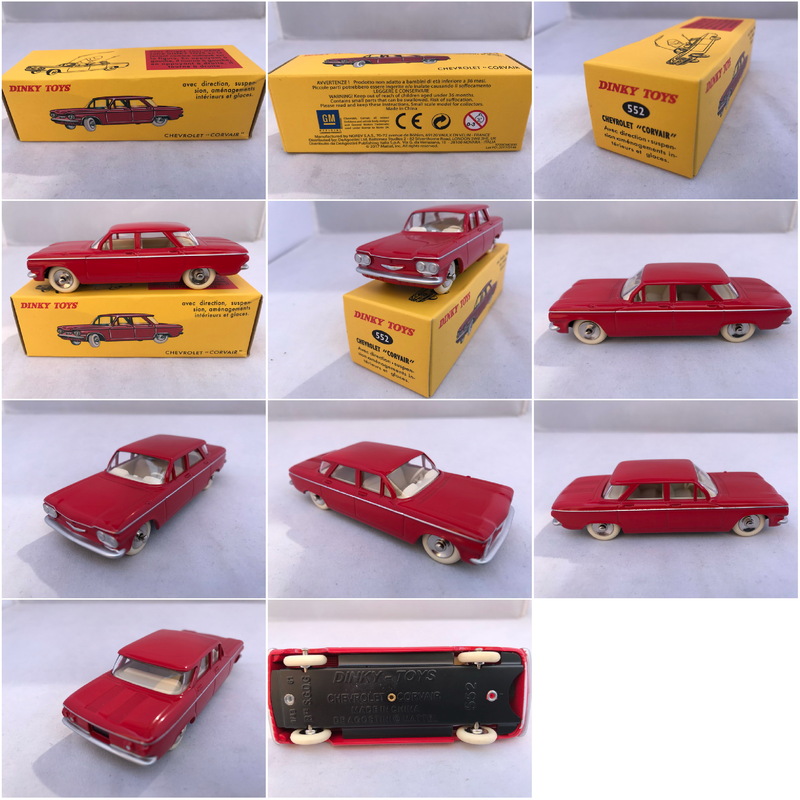 Dinky Toys by Atlas Editions #552 Chevrolet Corvair (Red). 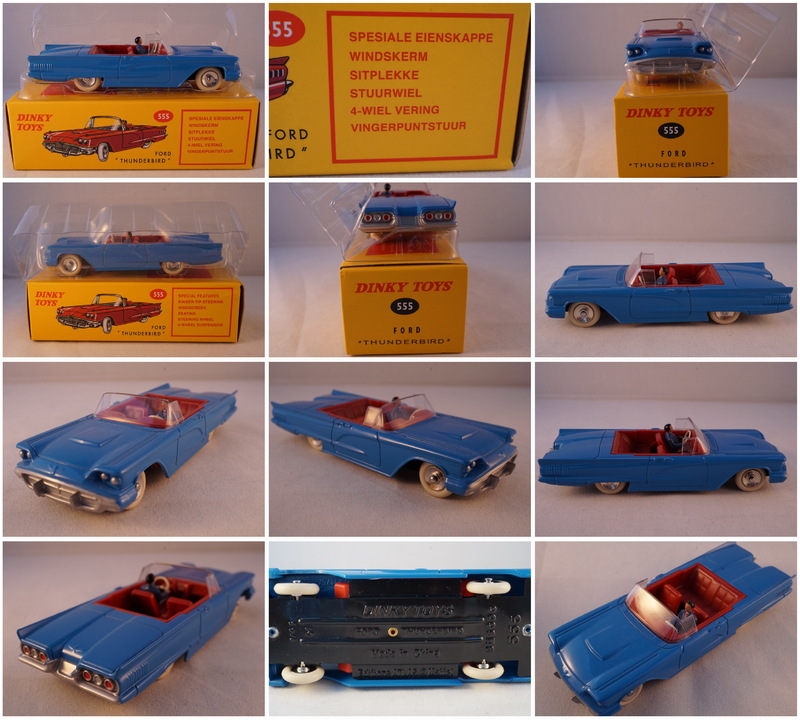 Dinky Toys by Atlas Editions #555 Ford Thunderbird (Blue). 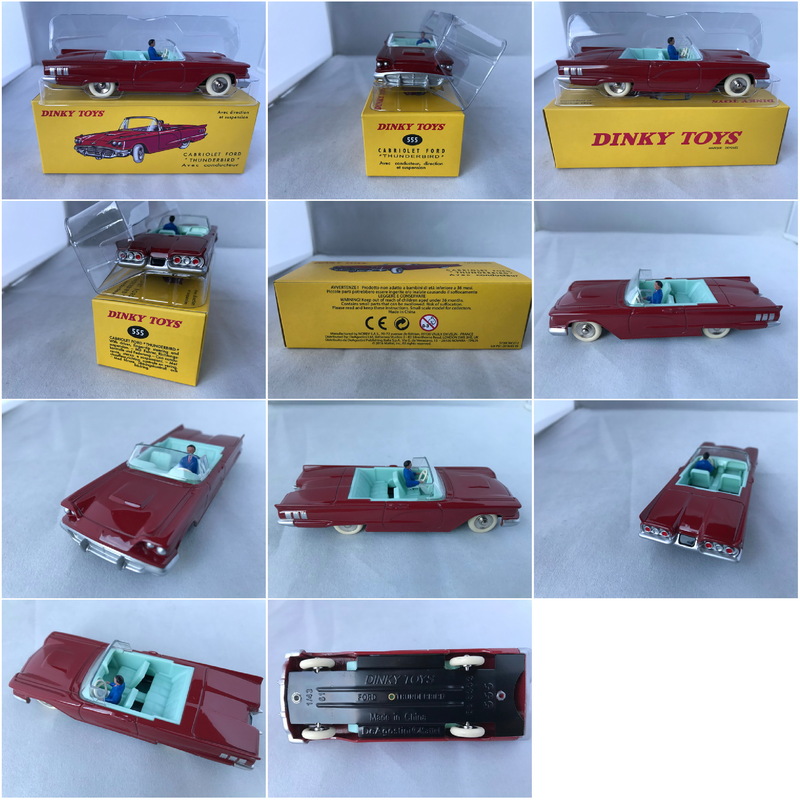 Dinky Toys by DeAgostini #555 Ford Thunderbird (Red). 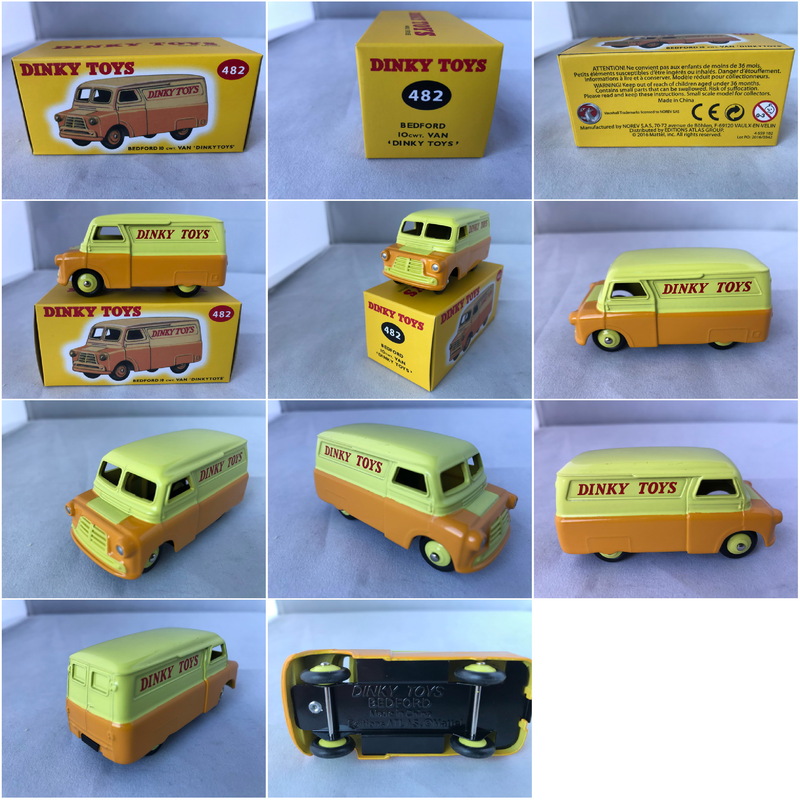 Dinky Toys by Atlas Editions #564 Renault Estafette "glaziers van" (Orange). 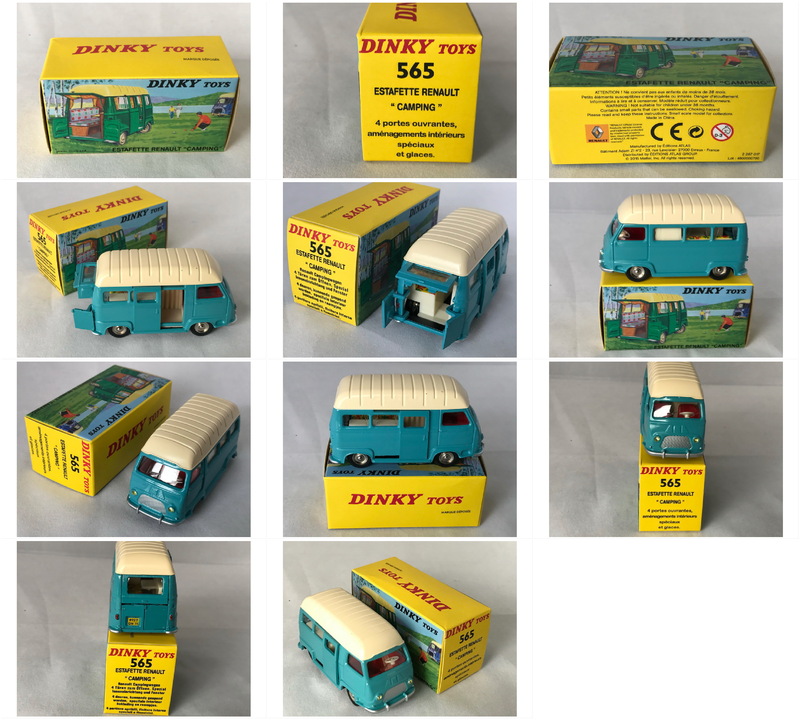 Dinky Toys by Atlas Editions #565 Renault Estafette "camping" (Blue/white roof). 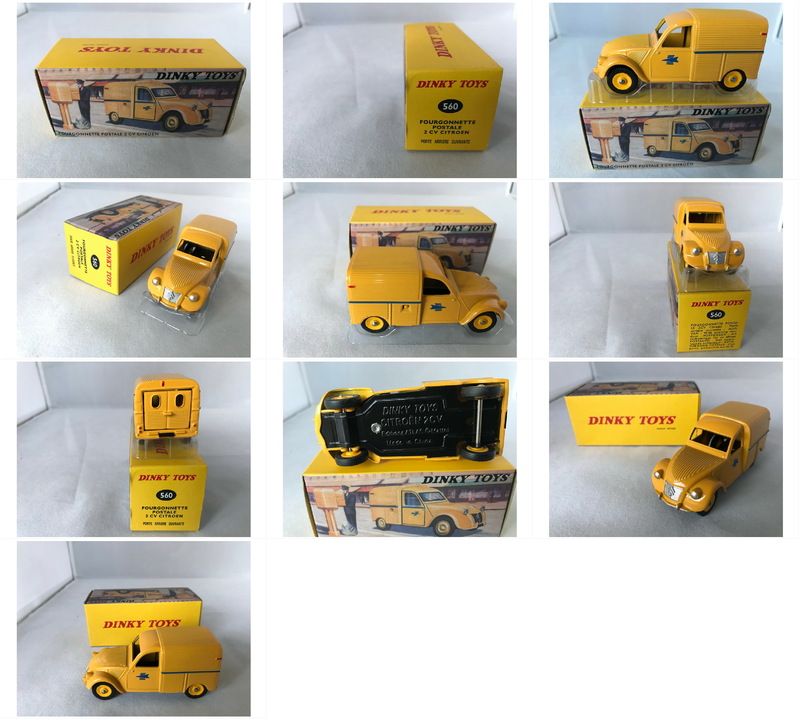 Dinky Toys by Atlas Editions #569P Berliet Stradair (Yellow). 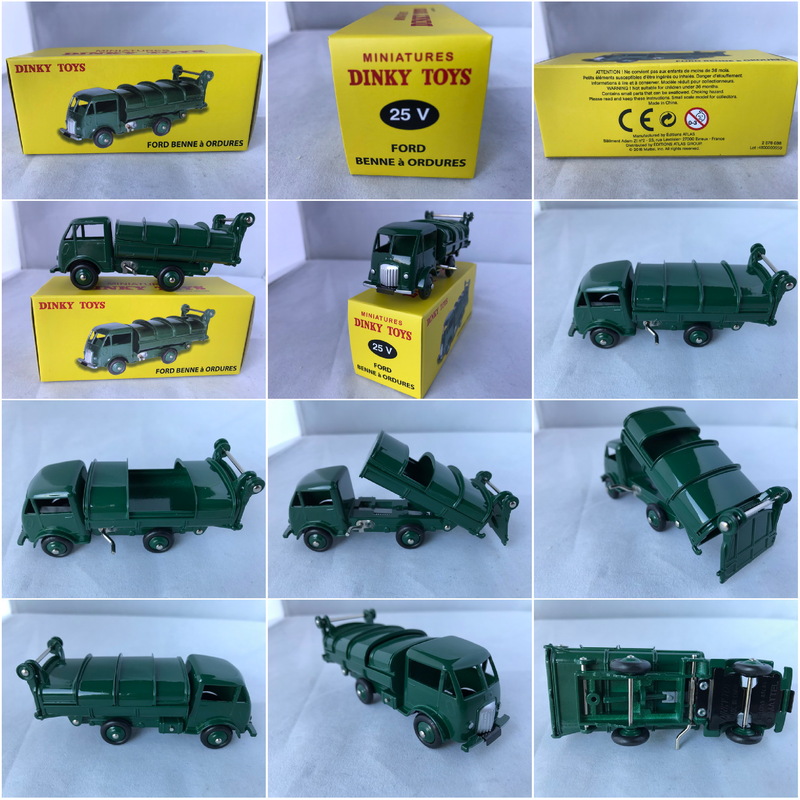 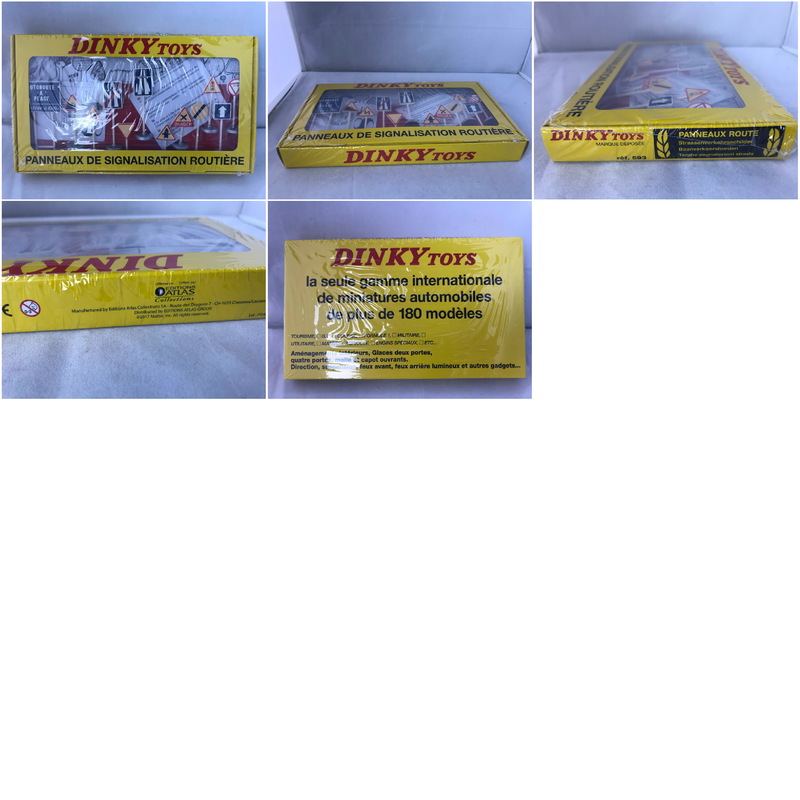 Dinky Toys by Atlas Editions #593 Panneaux Route. 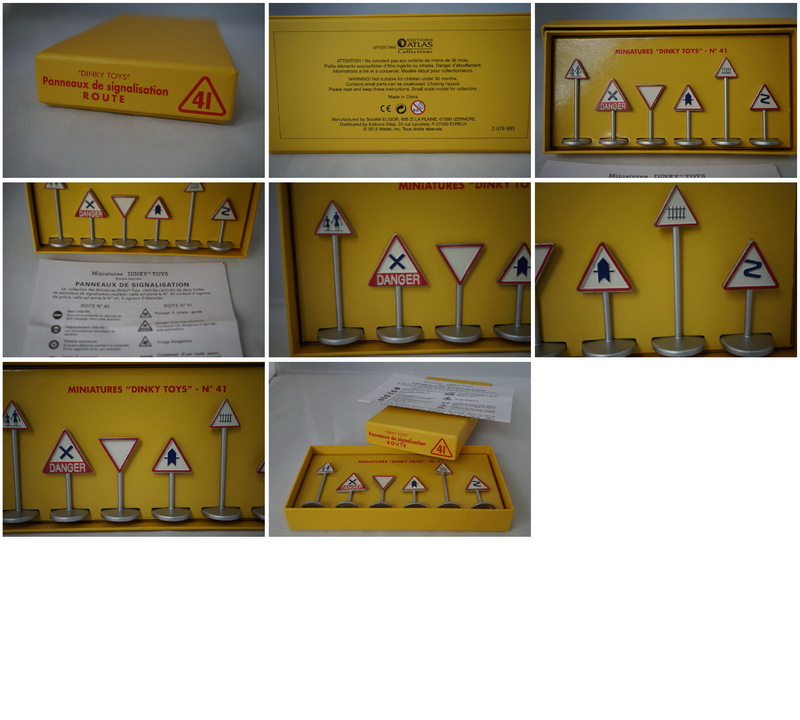 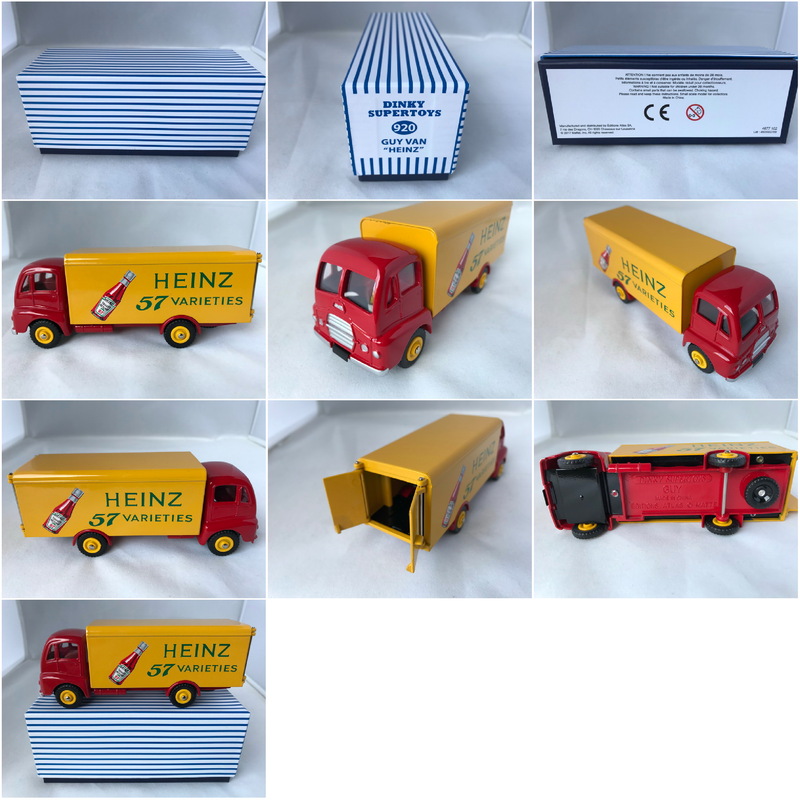 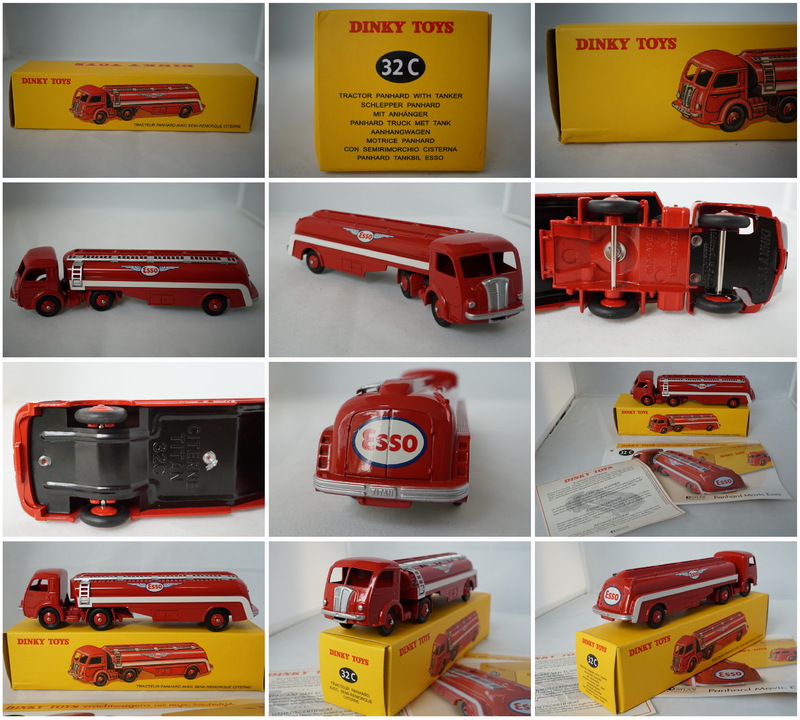 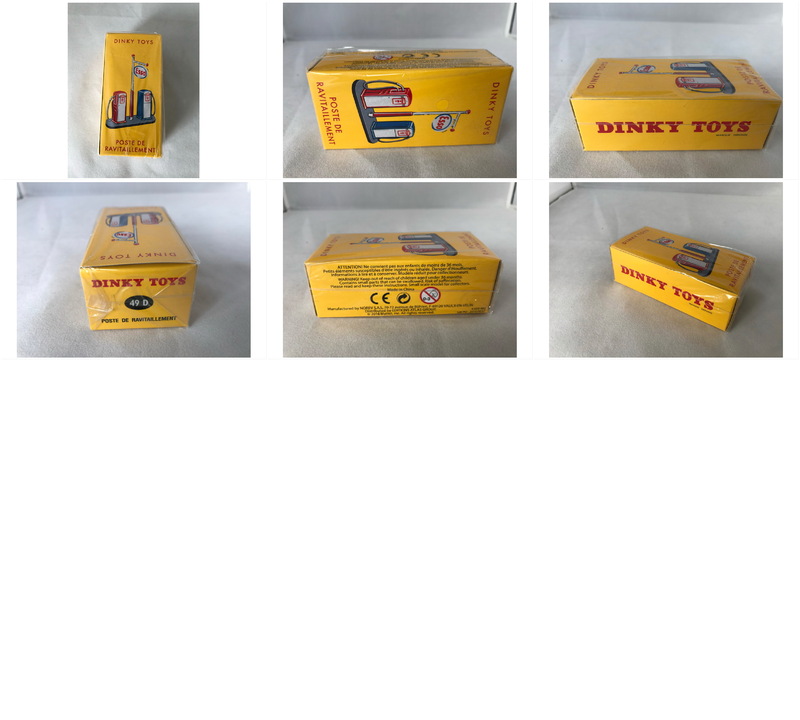 Dinky Toys by Atlas Editions #920 Guy Van "Heinz" (Red/Yellow). 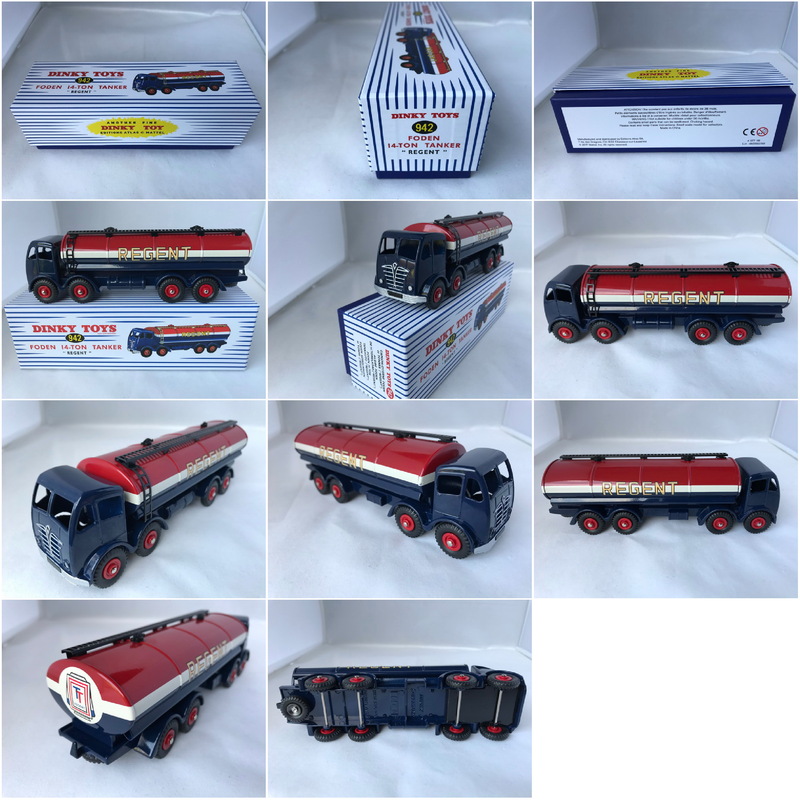 Dinky Toys by Atlas Editions #942 Foden 14-ton tanker "REGENT" (Blue). 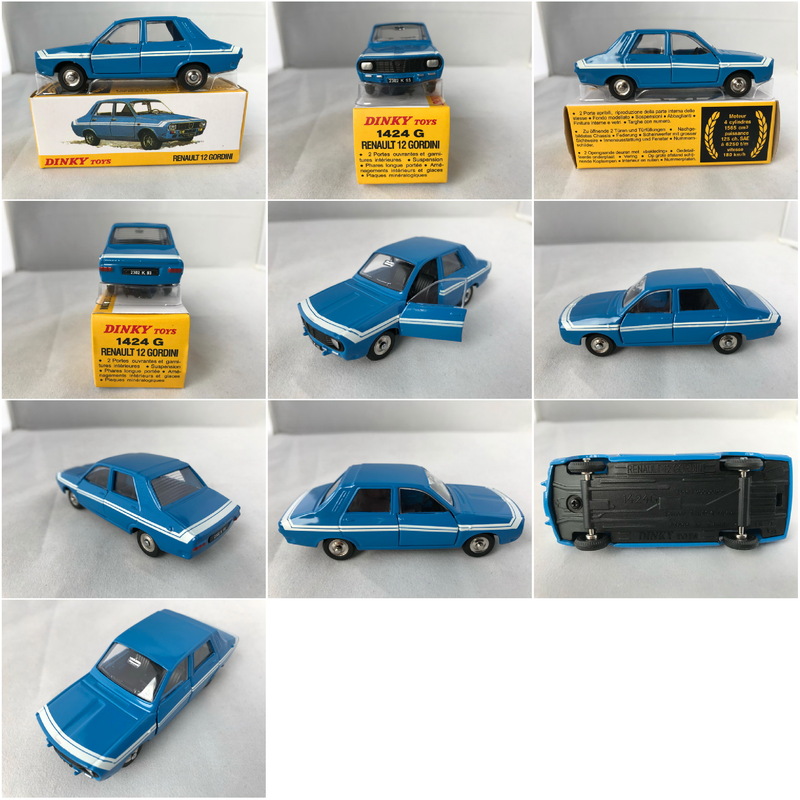 Dinky Toys by Atlas Editions #1405 Opel Rekord 1900 coupe (Blue). 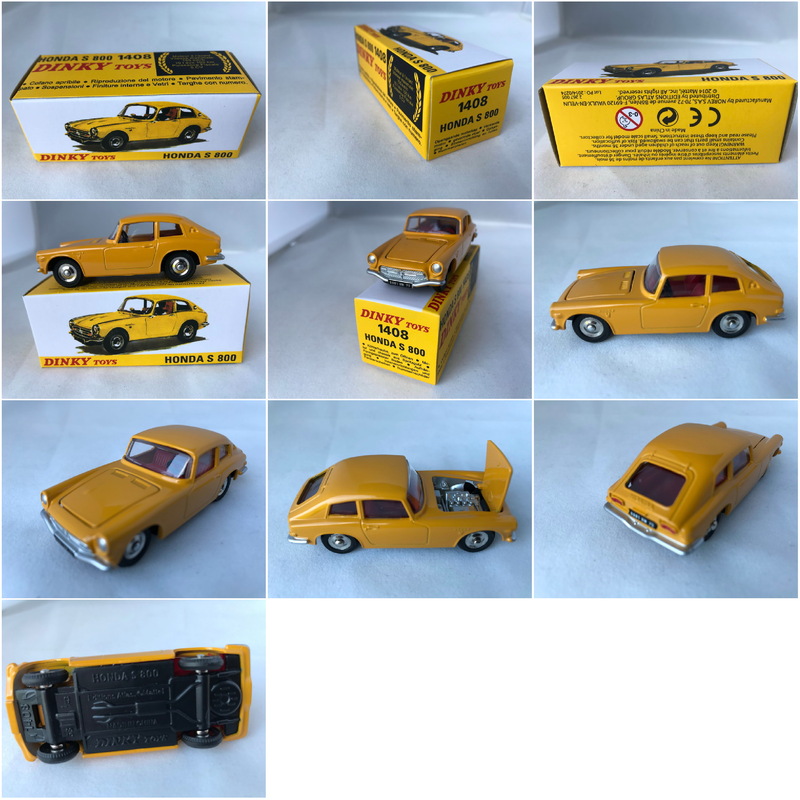 Dinky Toys by Atlas Editions #1408 Honda S800 (Yellow). 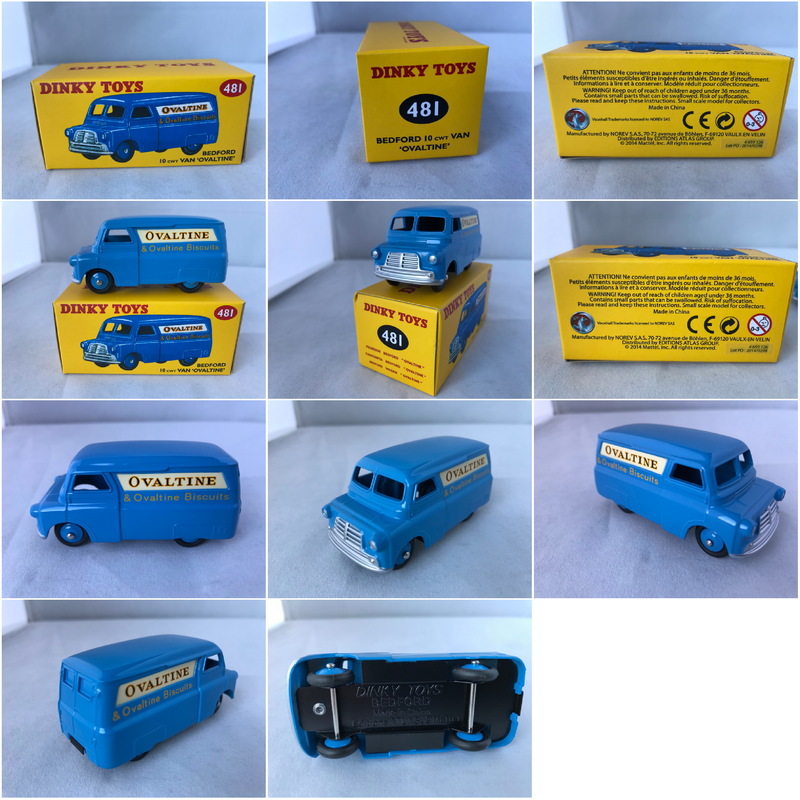 Dinky Toys by Atlas Editions #1424 Renault 12 Gordini (Blue; white striping). 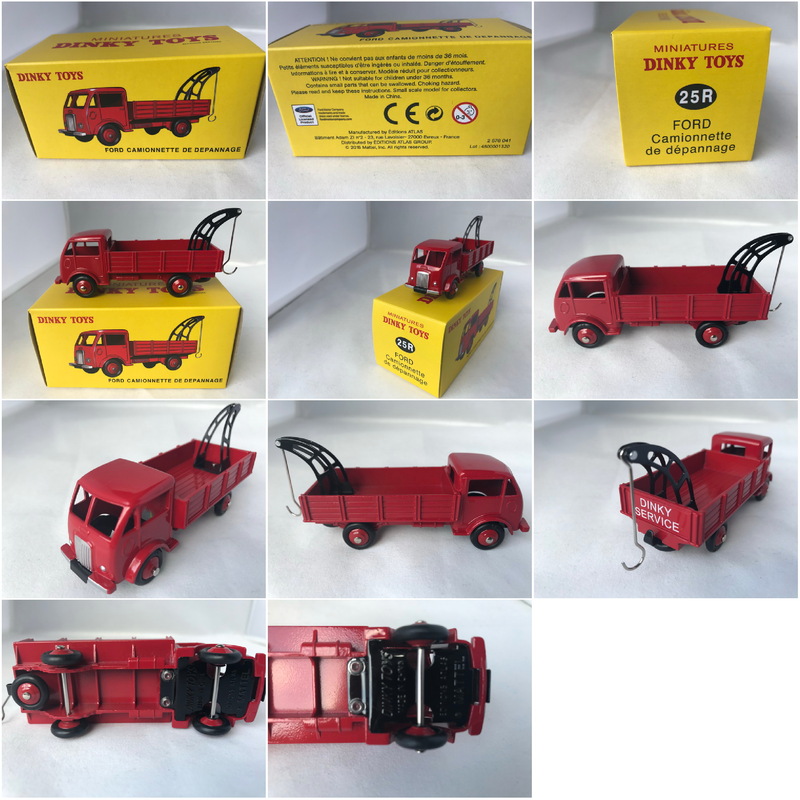 Dinky Toys by Atlas Editions; Keyring "Dinky Toys Club" + Dinky Toys emblem. 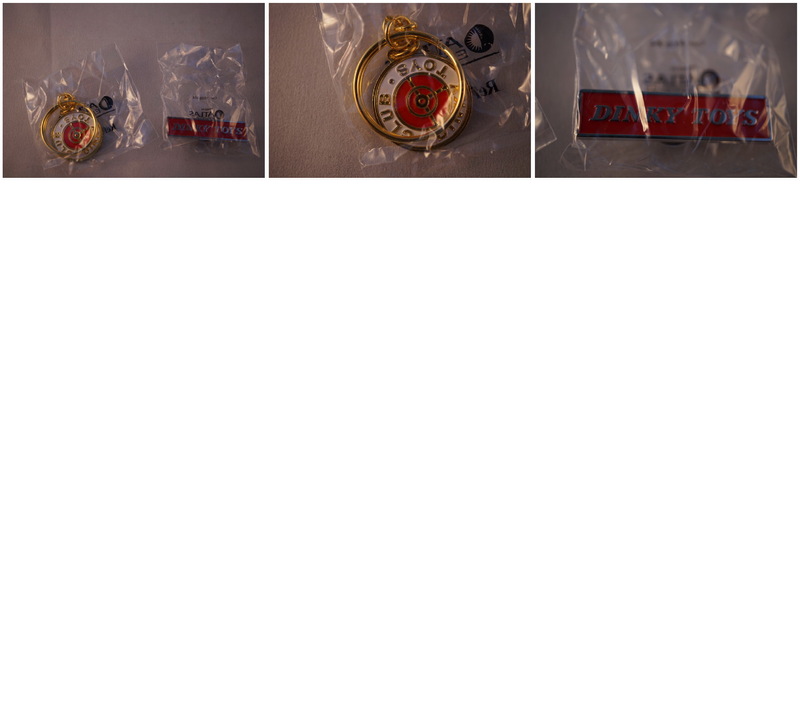 Mint still in sealed plastic bags.